8.16.... 6th August 1945. Then for a brief second the world stopped and in a moment later the first Atomic Blast took place as "Little Boy" 1,900 feet (580 m) exploded above the city of Hiroshima, Japan. Three days later on August 9, 1945, Bockscar, flown by Charles Sweeney's crew, carried "Fat Man", with Kokura as the primary target and Nagasaki the secondary target. The weather and earlier bombing smoke made Kokura a poor target and Nagasaki then became the second and last atomic target at 11:02. The delivery aircraft for both of those atomic raids was the Boeing B-29 Superfortress, In just those few days both the attacks and the aircraft that carried the weapons were joined together in history. 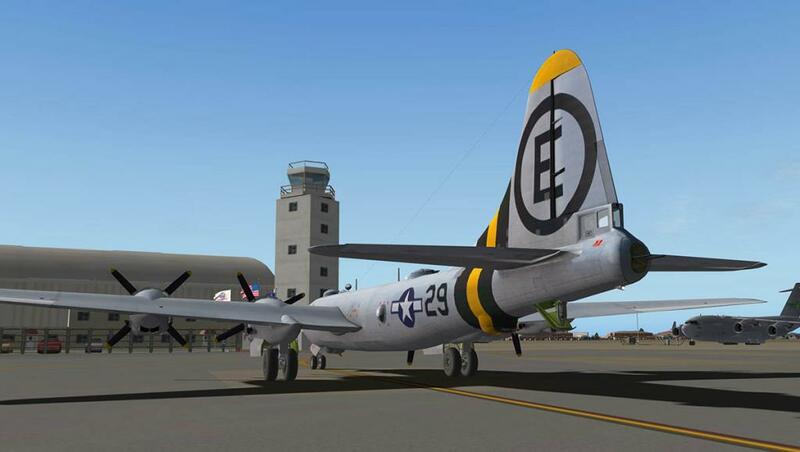 Enola Gay and Bockscar are now both museum pieces (Enola Gay is currently in the Steven F. Udvar-Hazy Center at Washington Dulles International Airport and Bockscar is now situated in the National Museum of the United States Air Force in Dayton, Ohio). 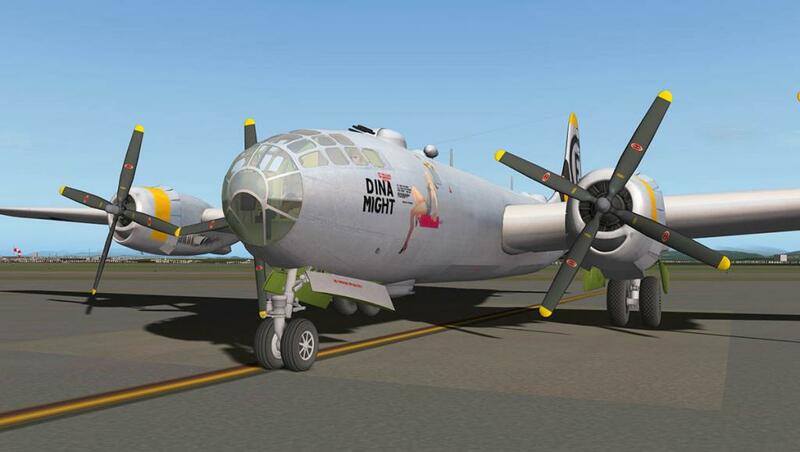 these two aircraft are the title bearers of the 3,970 Superfortresses that were built, but only one more name in B-29's still lives on in "FiFi", in that it is still the last flying B-29 left which belongs to the Commemorative Air Force (one more is under restoration). 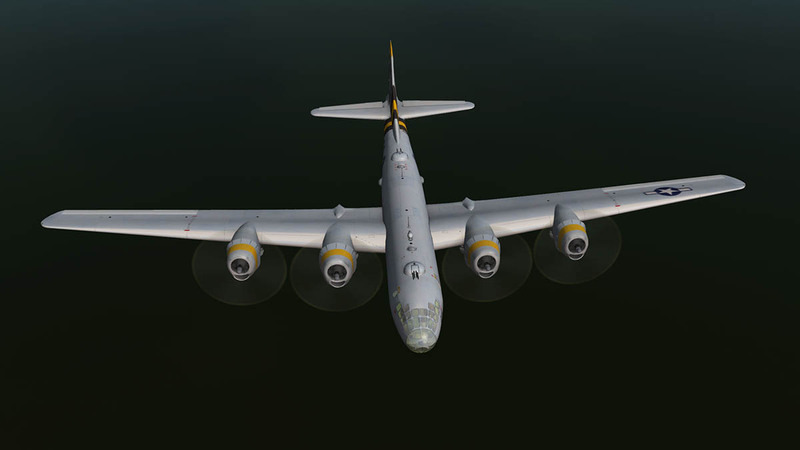 But the Atomic (gadget) aircraft are only a small part of the long history of this four-engine propeller-driven heavy bomber which was designed by Boeing and was flown primarily by the United States toward the end of World War II and during the Korean War. 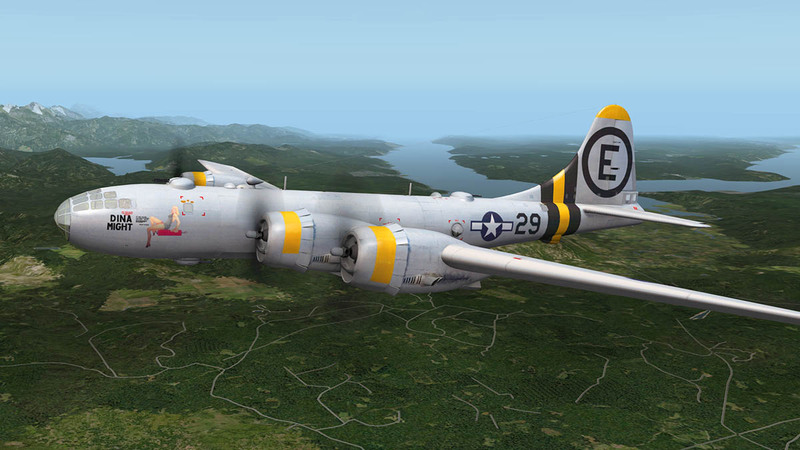 It was one of the largest aircraft to have seen service during World War II and it was a very advanced bomber for its time, with features such as a pressurized cabin, an electronic fire-control system, and remote-controlled machine-gun turrets. 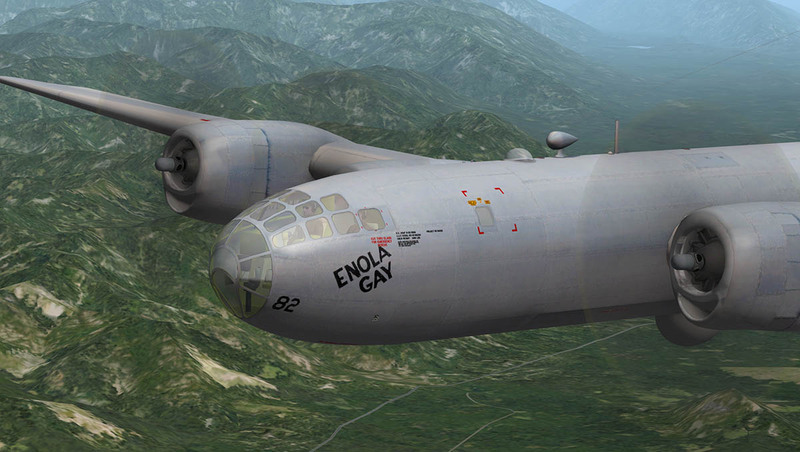 Boeing began work on pressurized long-range bombers as early as 1938. 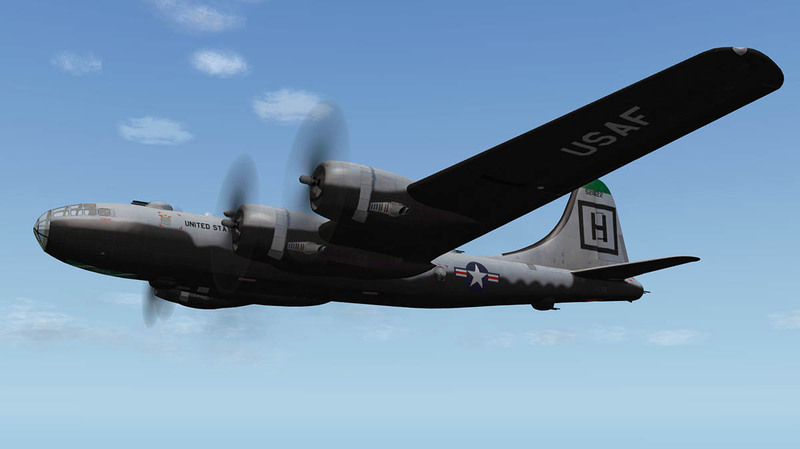 Boeing submitted its Model 345 on 11 May 1940 for the United States Army Air Corps request, in competition with designs from Consolidated Aircraft (the Model 33, later to become the B-32), Lockheed (the Lockheed XB-30), and Douglas (the Douglas XB-31). Douglas and Lockheed soon abandoned work on their projects, but Boeing received an order for two flying prototypes, given the designation XB-29, and an airframe for static testing on 24 August 1940, with the order being revised to add a third flying aircraft on 14 December. 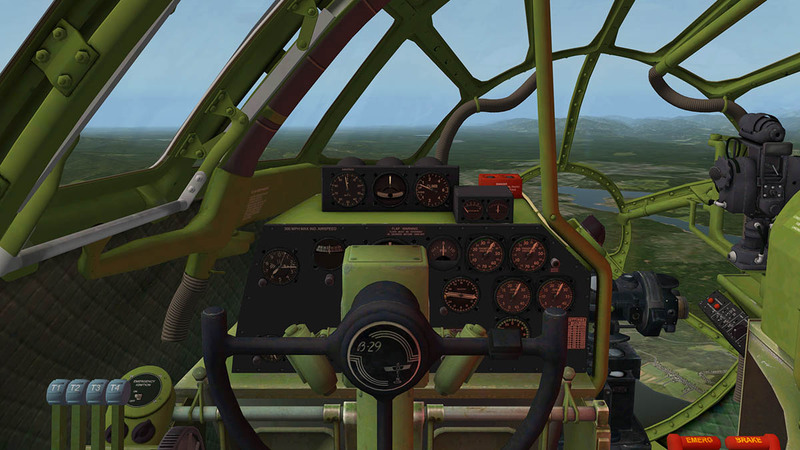 An initial production order for 14 service test aircraft and 250 production bombers was placed in May 1941, this being increased to 500 aircraft in January 1942. 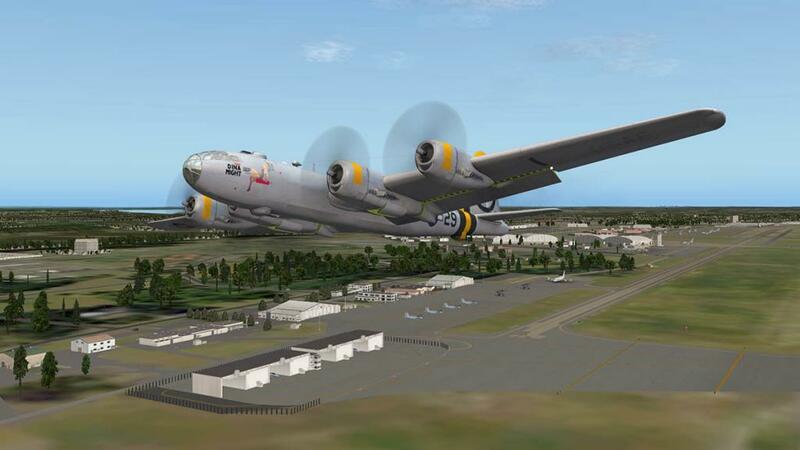 The first prototype made its maiden flight from Boeing Field, Seattle on 21 September 1942. 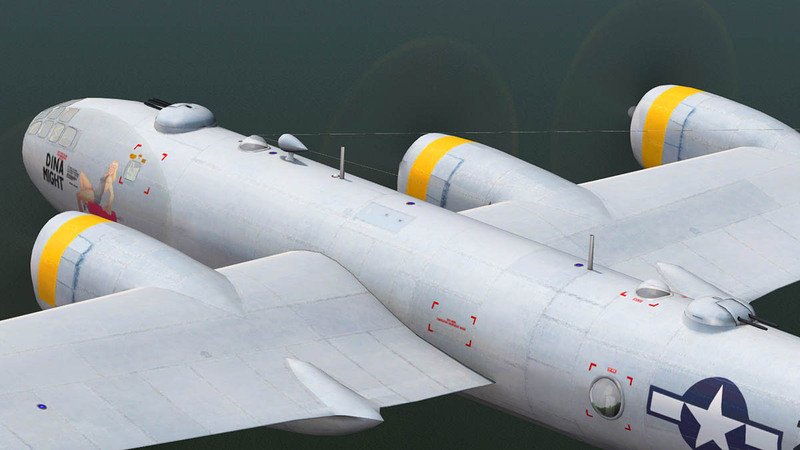 But because of the aircraft's very highly advanced design and challenging requirements, and immense pressure for war production the development was deeply troubled. 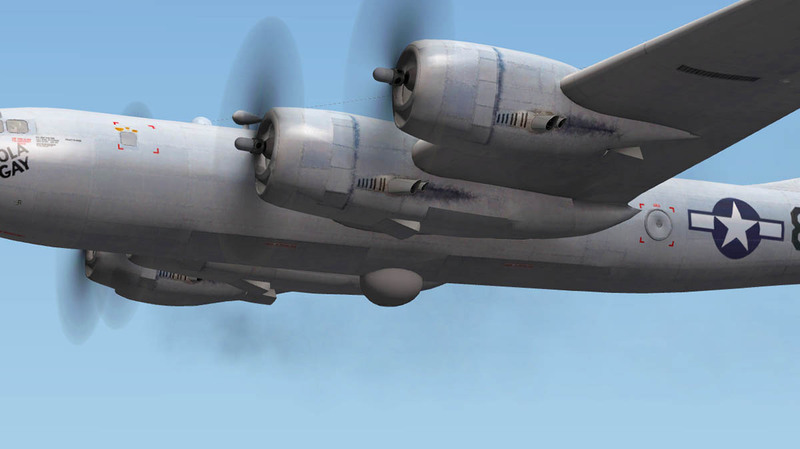 The second prototype, which, unlike the unarmed first, was fitted with a Sperry defensive armament system using remote-controlled gun turrets sighted by periscopes then first flew on 30 December 1942, this flight being terminated due to a serious engine fire. On 18 February 1943, the second prototype experienced an engine fire and crashed. 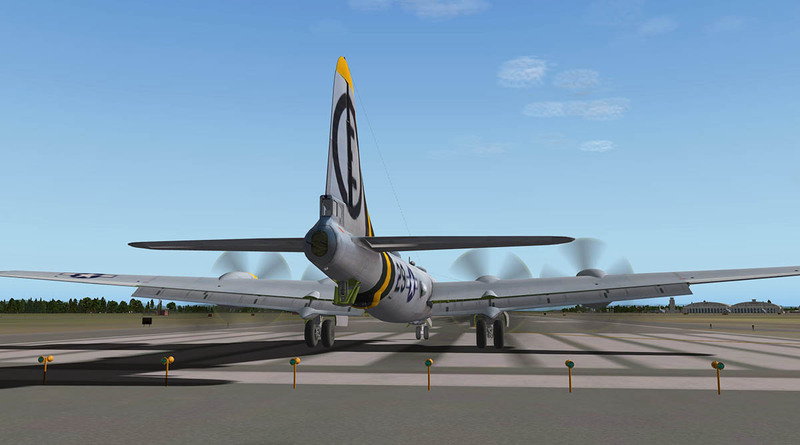 In fact the troublesome engines which were Wright R-3350 Duplex Cyclone radial engines then later went on to become a more trustworthy workhorse in large piston-engined aircraft when updated as the later Pratt & Whitney R-4360 "Wasp Major's", but these R-3350 early models were beset with dangerous reliability problems in mostly in keeping them cool and in one piece. Takeoff was known as being an "urgent struggle for airspeed" (generally, flight after takeoff should consist of striving for altitude). 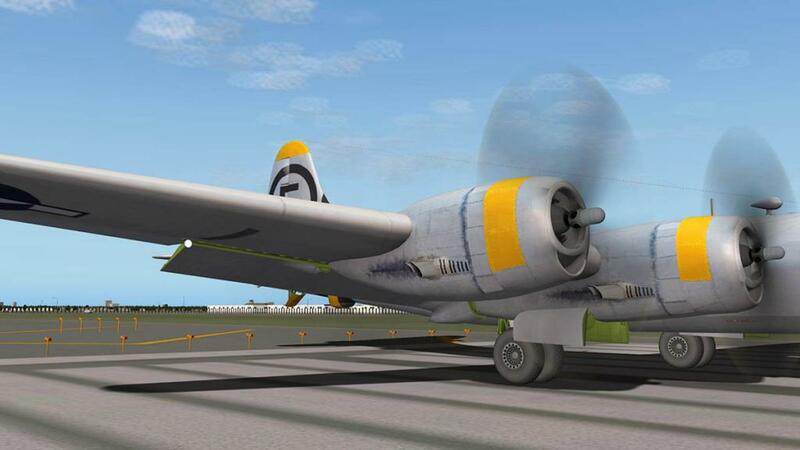 But these large radial engines needed a lot of airflow to keep them cool, and failure to get up to speed (or collect that vital airflow) as soon as possible could result in an engine failure and risk of fire. 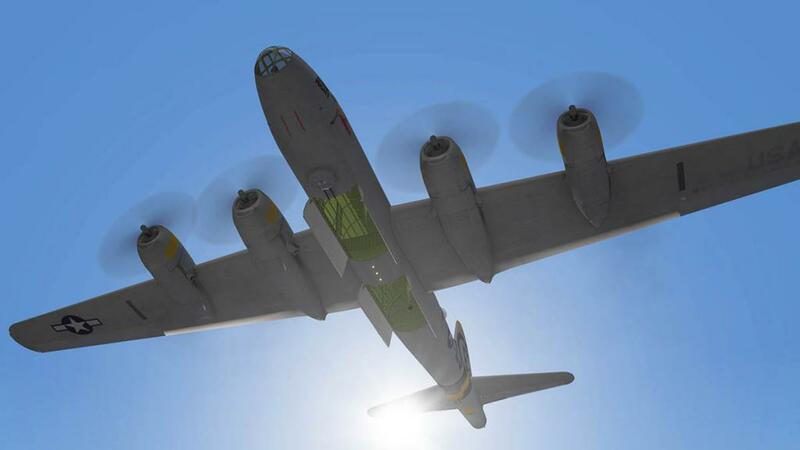 Interim fix measures included cuffs placed on propeller blades to divert a greater flow of cooling air into the intakes, which had baffles installed to direct a stream of air directly onto the exhaust valves. Oil flow to the valves was also increased, asbestos baffles installed around rubber push rod fittings to prevent oil loss, and thorough pre-flight inspections made to detect unseated valves and the frequent replacement of the uppermost five cylinders (every 25 hours of engine time) and the entire engines (every 75 hours). 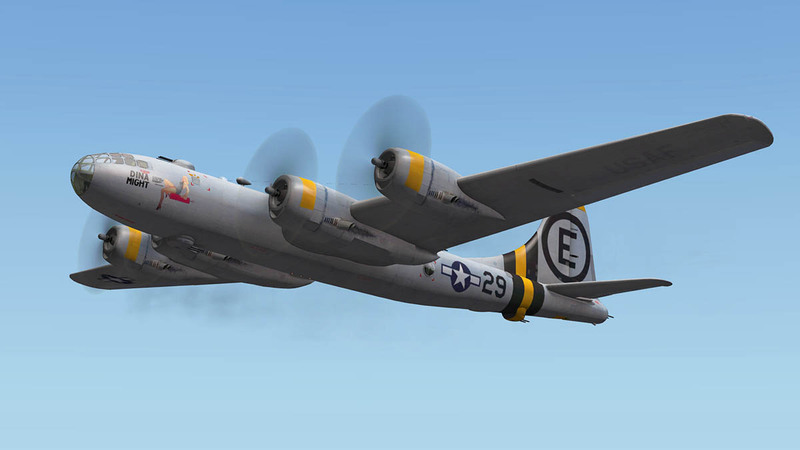 In wartime, the B-29 was capable of flight at altitudes up to 31,850 feet (9,710 m), and at speeds of up to 350 mph (560 km/h) (true airspeed). 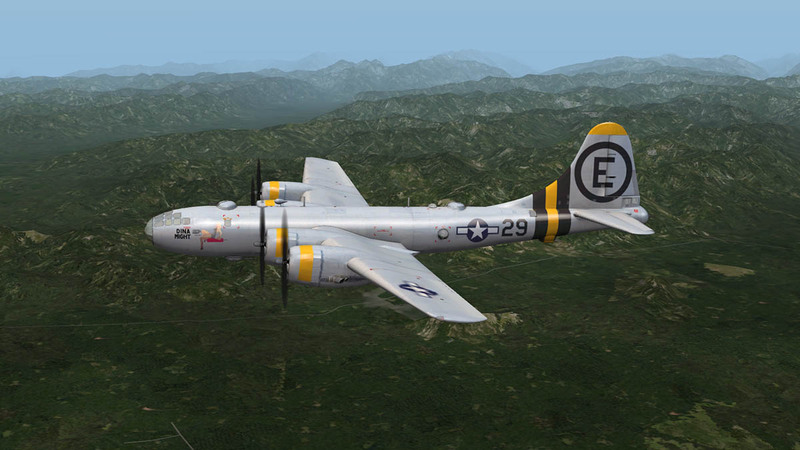 This was the aircraft's best defense because Japanese fighters could barely reach that altitude, and the few could catch the B-29 even if they did attain that altitude. 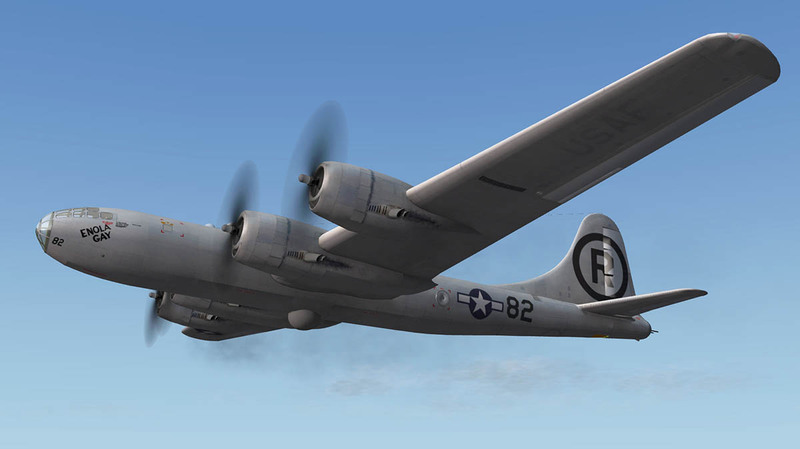 The B-29's revolutionary Central Fire Control system included four remotely controlled turrets armed with two .50 Browning M2 machine guns each. 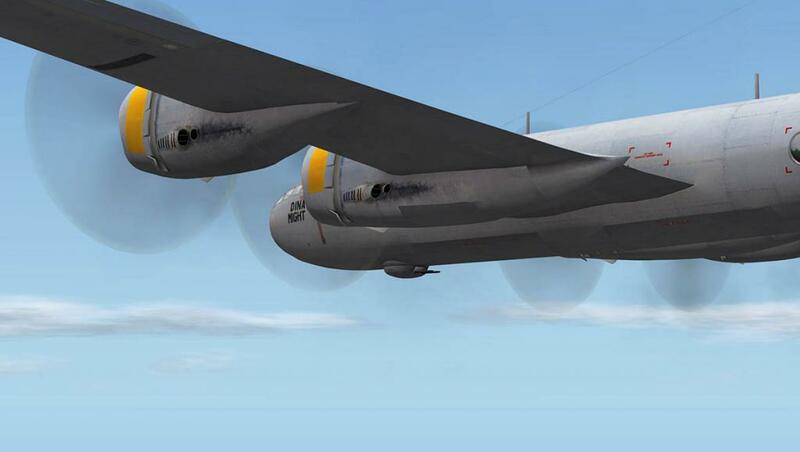 All weapons were aimed electronically from five sighting stations located in the nose and tail positions and three Perspex blisters in the central fuselage. 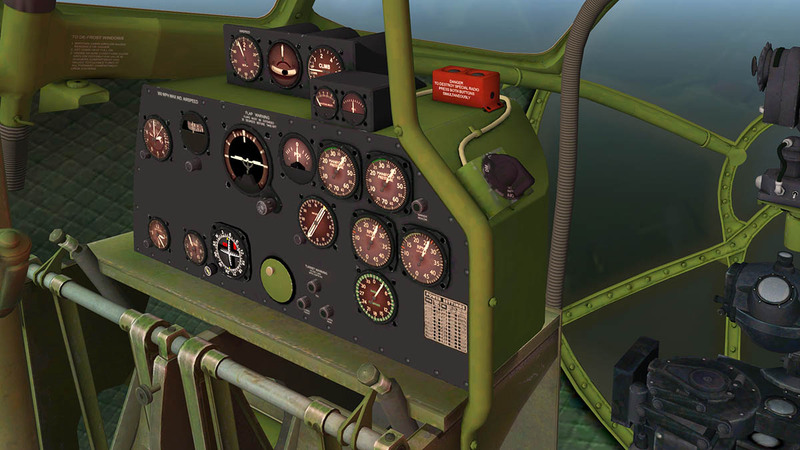 There was five General Electric analog computers (one dedicated to each sight) that increased the weapons' accuracy by compensating for factors such as airspeed, lead, gravity, temperature and humidity. 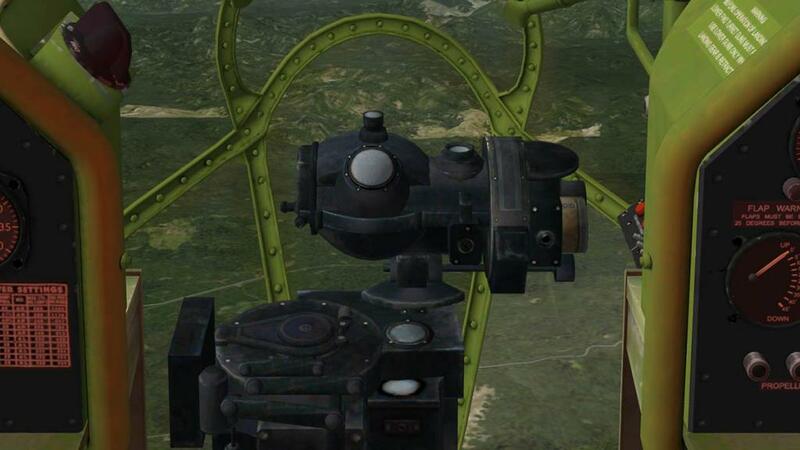 The computers also allowed a single gunner to operate two or more turrets (including tail guns) simultaneously. 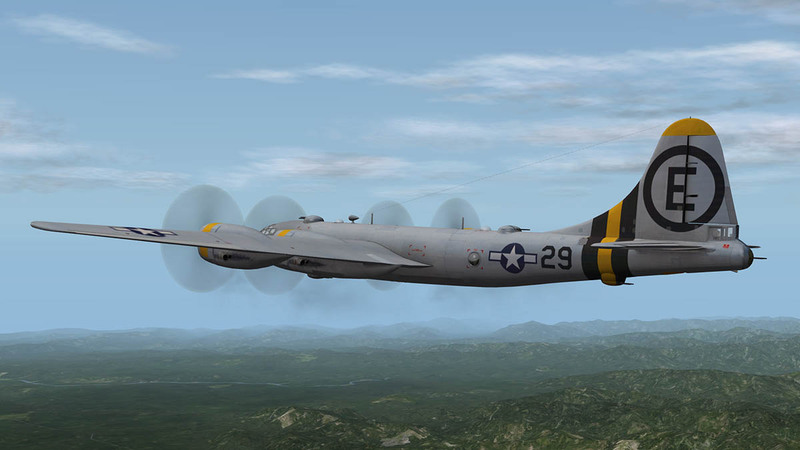 The gunner in the upper position acted as fire control officer, managing the distribution of turrets among the other gunners during combat.... now you know why it was called the Superfortress! 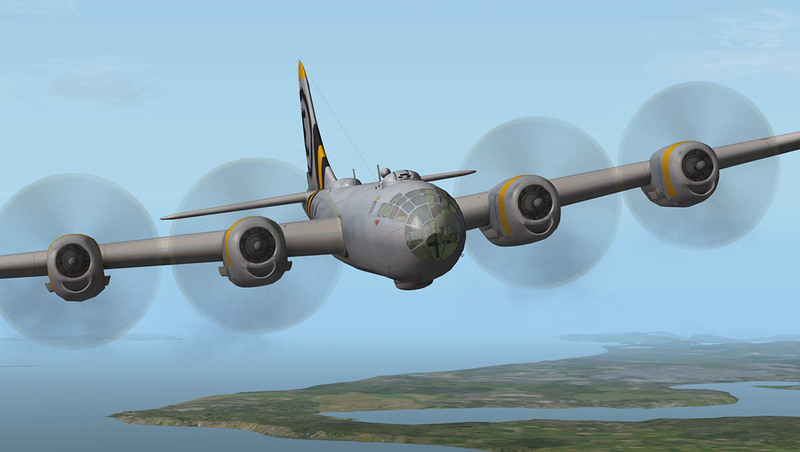 The crew enjoyed, for the first time in a bomber, full-pressurization comfort. This first-ever cabin pressure system for an Allied production bomber was developed for the B-29 by Garrett AiResearch. 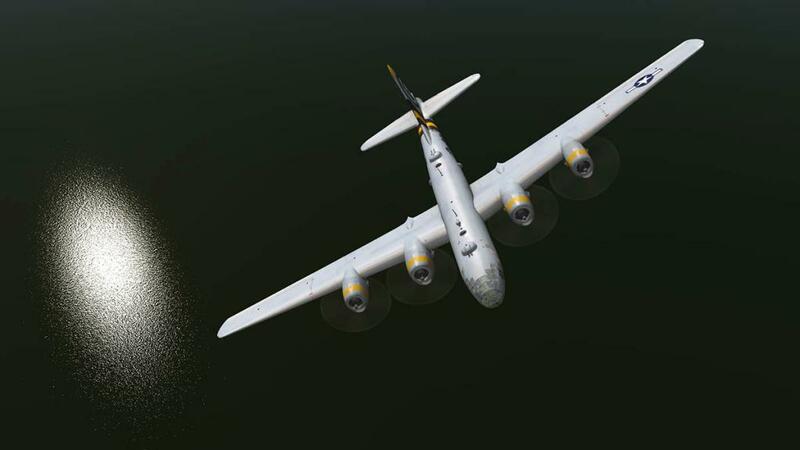 The nose and the cockpit were pressurized, but the designers were faced with deciding whether to have bomb bays that were not pressurized as sited between the fore and aft pressurized sections, or a fully pressurized fuselage with the need to de-pressurize to drop their loads. 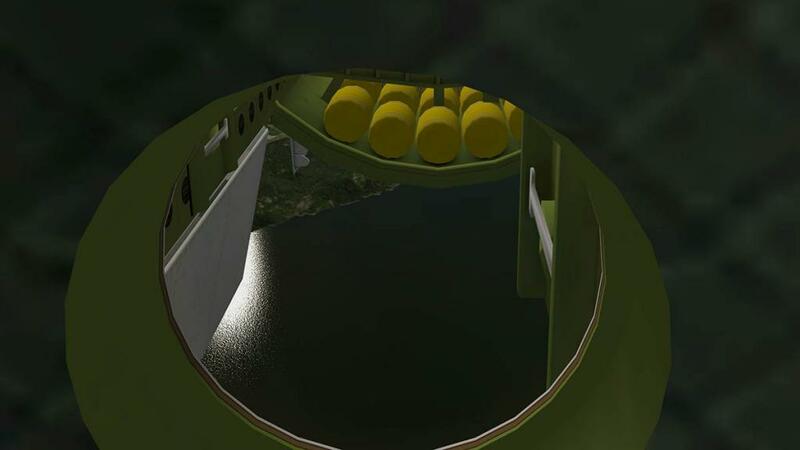 The decision was taken to have a long tunnel over the two bomb bays so that crews could crawl back and forth between the fore and aft sections, with both areas and the tunnel pressurized. 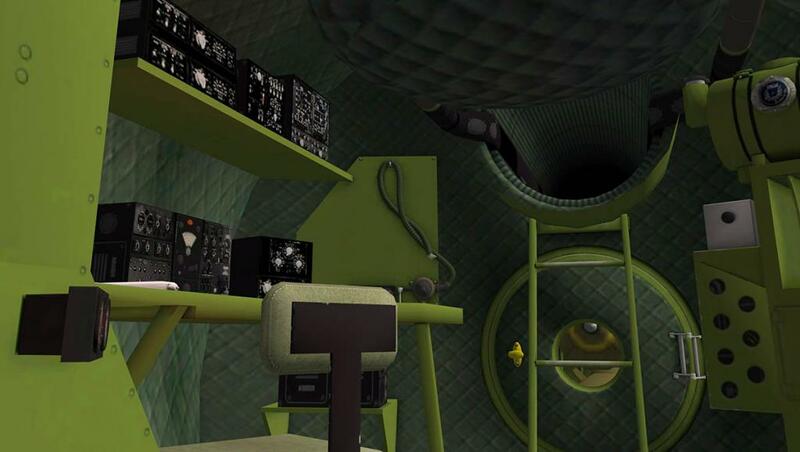 The bomb bays themselves were not pressurized. The B-29 was the first strategic aircraft and formed the mainstay of the required combat equipment of Strategic Air Command when it was formally formed on 21 March 1946. 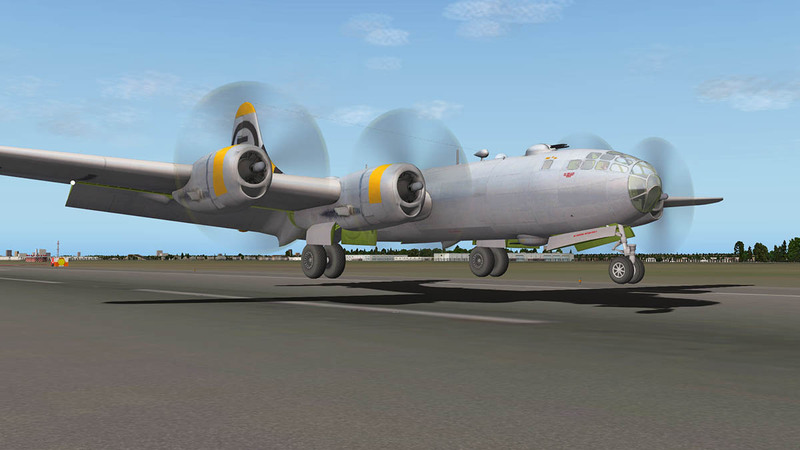 Other significant B-29 versions were used to drop the famous Bell X-1 supersonic research rocket aircraft (Chuck Yeager fame) and as a basis of a commercial airliner in the Boeing 337 Stratocruiser. 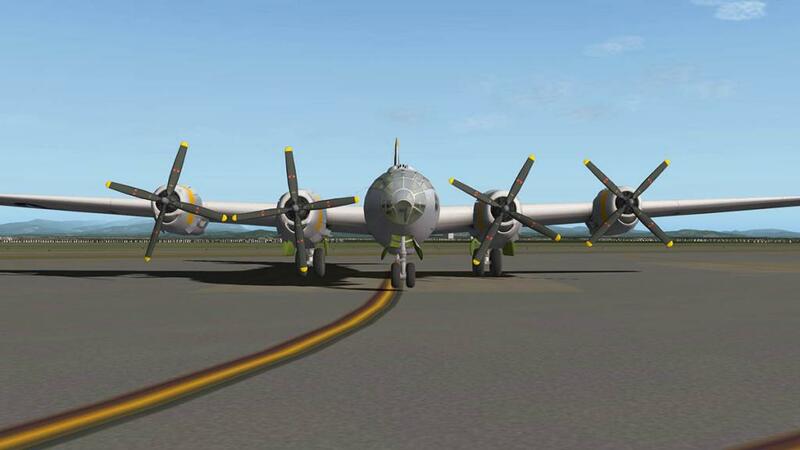 There was only one other significant variant know as the "Silverplate", which was formally the B-29's code reference for the participation in the Manhattan Project, So these versions of which there was 65 converted airframes (Including Enola Gay and Bockscar) are all the atomic aircraft used in the raids or testing of the Atomic Bombs. 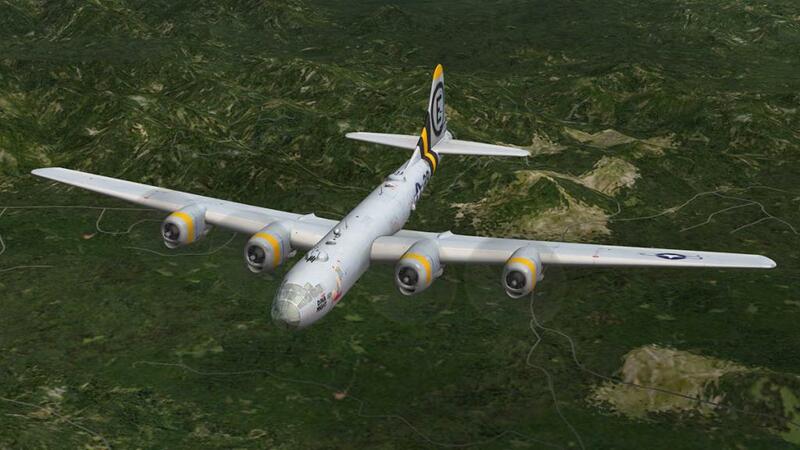 In time the B-29 was finally superseded by jet-engined powered aircraft like the Convair B-36 "Peacemaker" and the Boeing B-47 Stratojet, which in turn was then replaced by the Boeing B-52 Stratofortress. But there can be no doubt of the aircraft's incredible performance and certainly in the B-29's role not only in the famous Atomic raids but in turning the shape and tide of the Second World War in the Pacific Theater and in Korea. Performance: Maximum speed: 357 mph (310 knots, 574 km/h) : Cruise speed: 220 mph (190 knots, 350 km/h) : Stall speed: 105 mph (91 knots, 170 km/h) : Range: 3,250 mi (2,820 nmi, 5,230 km) : Ferry range: 5,600 mi (4,900 nmi, 9,000 km,) Service ceiling: 31850 ft (9,710 m) : Rate of climb: 900 ft/min (4.6 m/s). 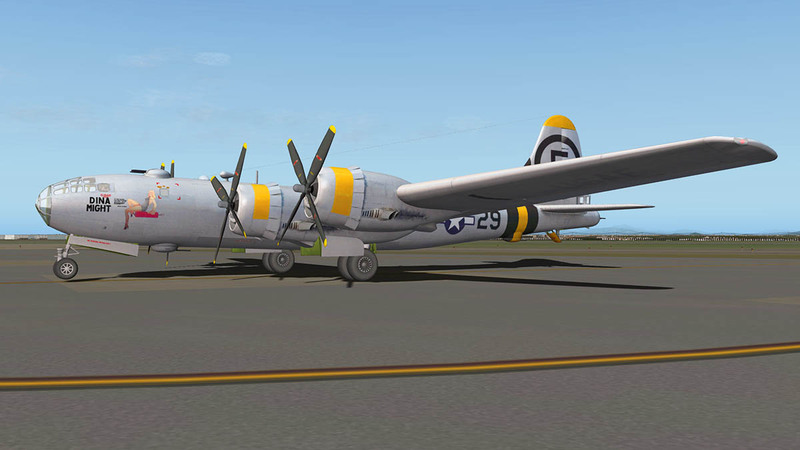 The B-29 Superfortress from Virtavia and Dawson Designs is originally a FS (Flight Simulator) aircraft converted extensively for X-Plane. As in the past with these conversions, X-Plane users seem to get the best from each simulation platform in great design qualities from FS and the great features and flying characteristics from the X-Plane universe. 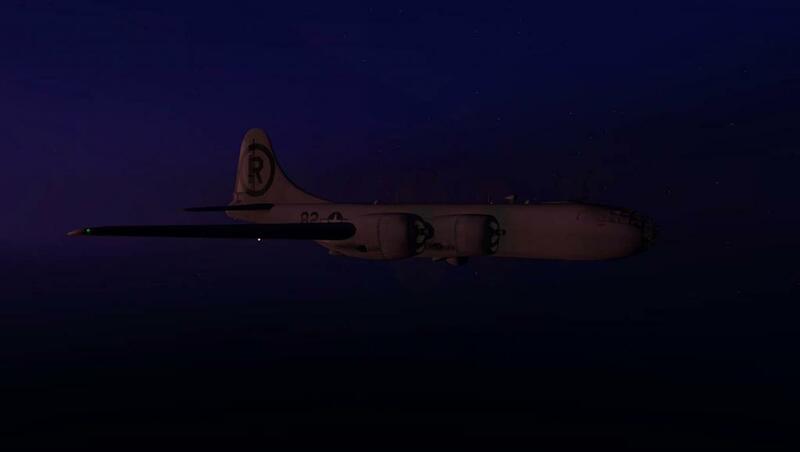 And the B-29 here does not disappoint. 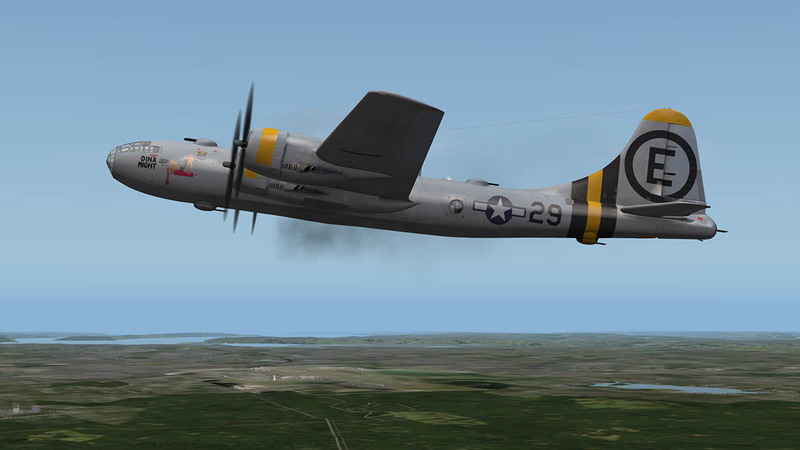 The B-29 is a bit of an illusion in that it has always looked a far larger aircraft than it actually is... 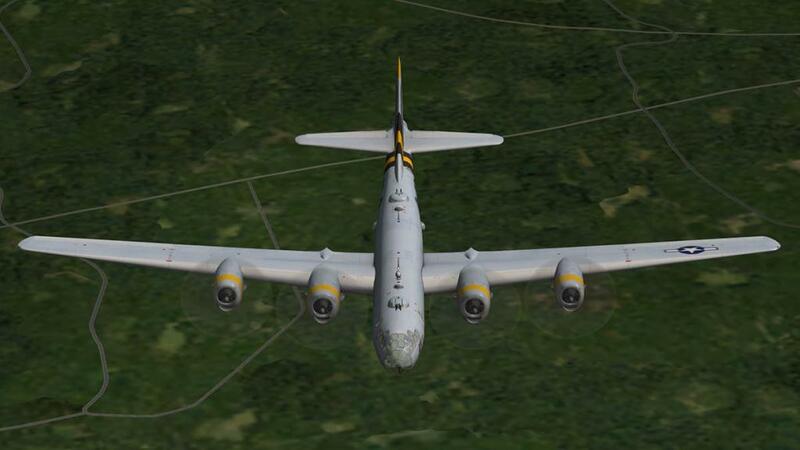 It is only 99 ft 0 in (30.18 m) in length as the B-17 Flying Fortress was 74 ft 4 in (22.66 m), but the B-52 Stratofortress is a massive 159 ft 4 in (48.5 m) or 60ft longer than its famous predecessor. Design wise the aircraft here is simply excellent, because of the tubular (pressurized) shape it can be very easy to get the aircraft wrong. But here it looks perfect. Externally the aircraft is undramatic, clean and functional. Internally it is in another dimension, with the ribbing and with that huge glass paneled nose. 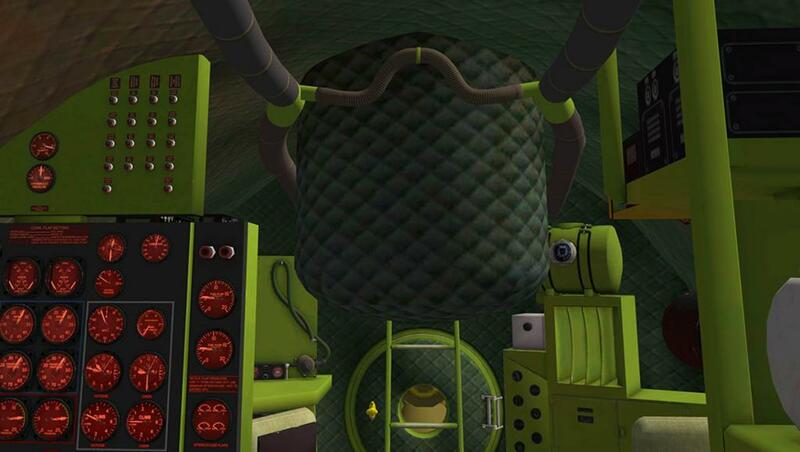 And you will need to love the colour green.... a lot. 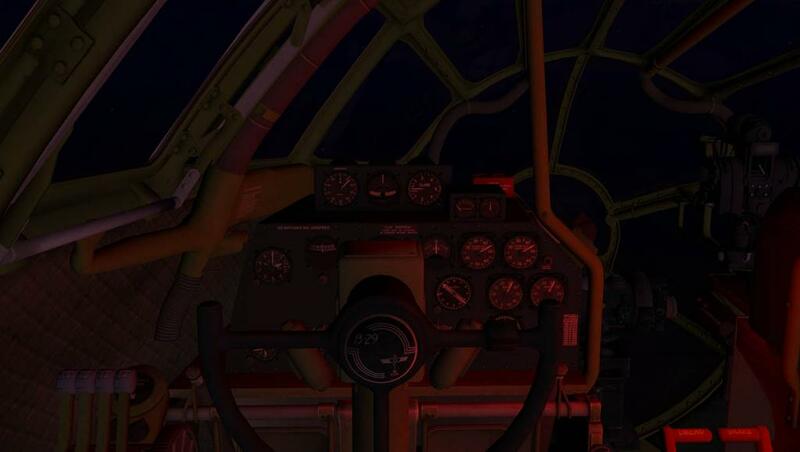 At first it feels at first like an earlier version of the "Millennium Falcon" of Star Wars fame, but no doubt that pilots converting from the B-17 must have thought the same thing in that they were in some sort of a future spaceship in the way the cockpit design was set out. So the comparison is valid. 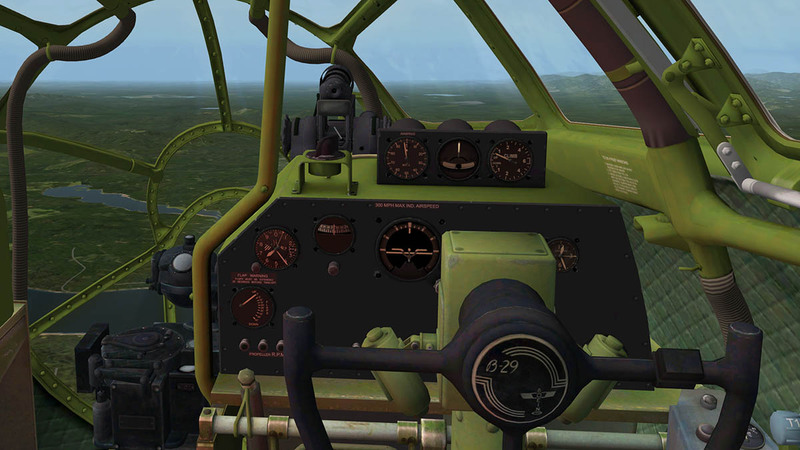 But in a short time you do find the B-29 quite familiar as you learn where everything is and what it does, but for the pilot and co-pilot a clean line of sight ahead it is still a bit of a challenge. 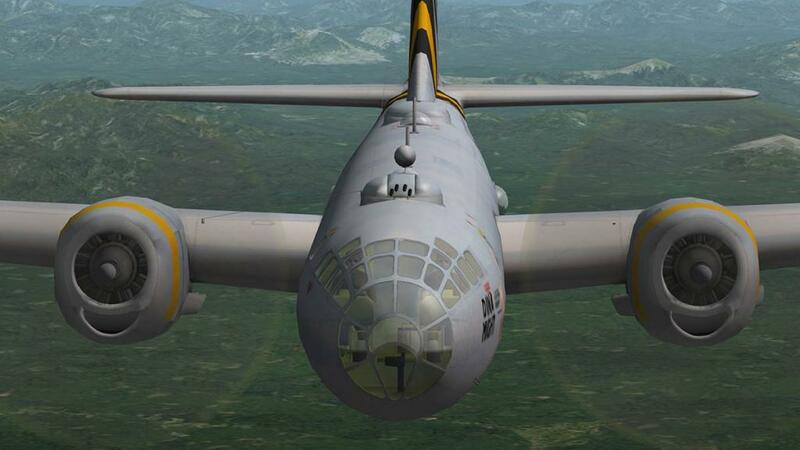 From the bomber aiming position deep in the nose the view is simply excellent. The pressurized front section is like capsule, of which in reality it is in being an airtight vessel. 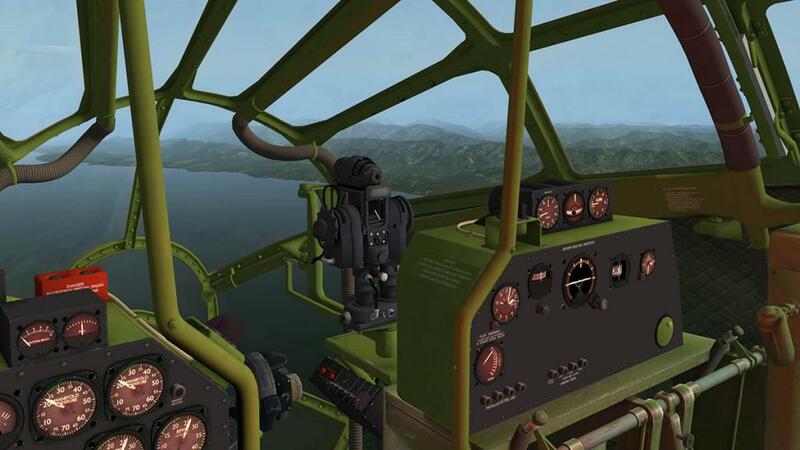 Going rearwards from the far front is first the Bombardier's aiming area and then the pilot and co-pilot's elevated positions... 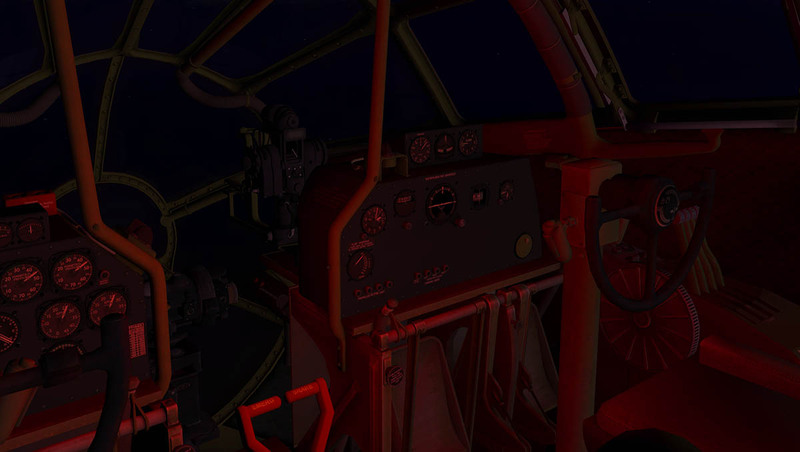 The next on the right behind the co-pilot is the Flight engineer's station and on the left (behind the pilot) is the Navigator. 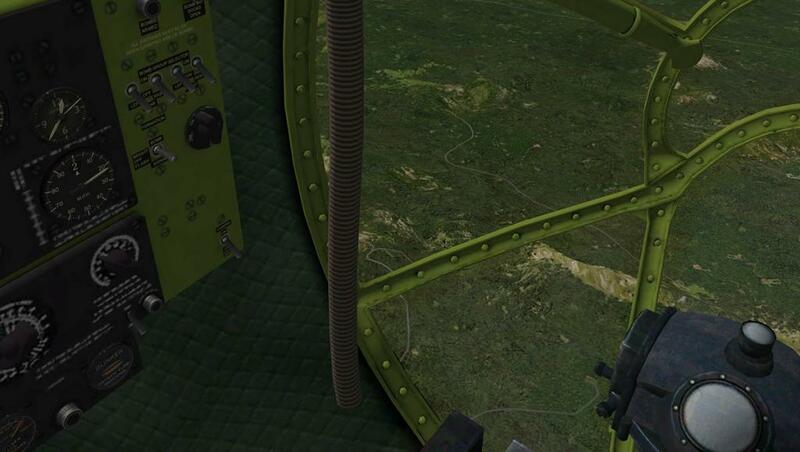 At the rear on the right is then the Radio Operator. 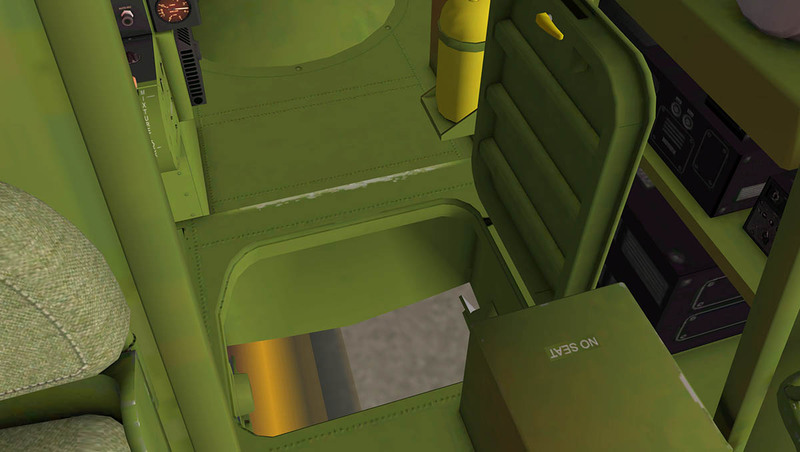 The rear of the cockpit is the lower pressure hatch to the unpressurized forward bomb bay. 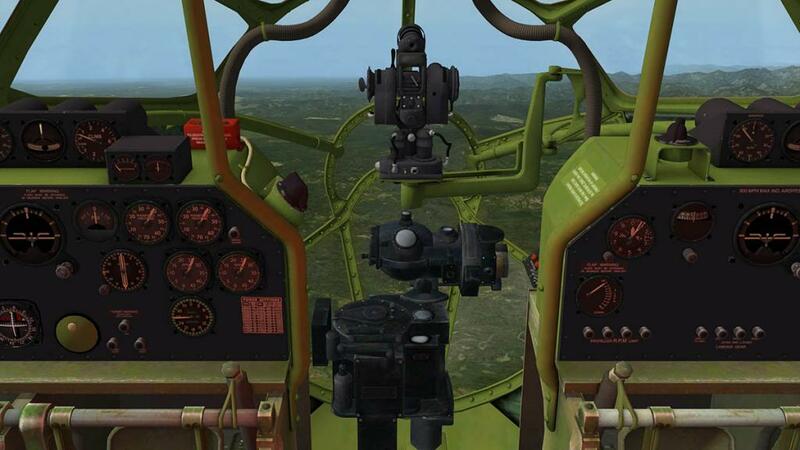 Above is the tunnel to the rear or central positions of the port and starboard waist gunners, top gunner and radar operator, far rear is the tail gunner. Sadly you can't go to the mid-section or into the tail... which is disappointing. This is a good point to note the different versions you have with this B-29 aircraft. They are the A and B versions. The "A" could be noted as the "Fortress" version, because it has the number of machine guns in the forward dorsal turrets was doubled to four, and there was three turrets in forward one on top of the fuselage and one below and one on top mid-section. 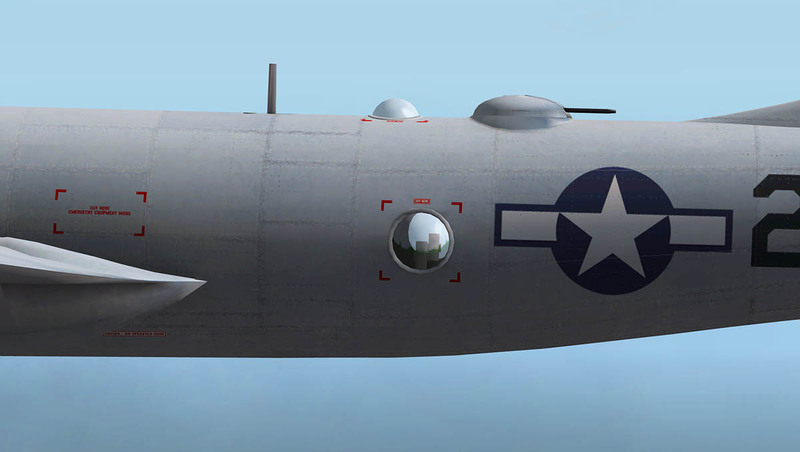 The "B" had all the defensive armament removed except for what was in the tail turret. Initially the armament was two .50 in M2/AN machine guns and one 20 mm M2 cannon which was soon changed to three .50 in M2/ANs. 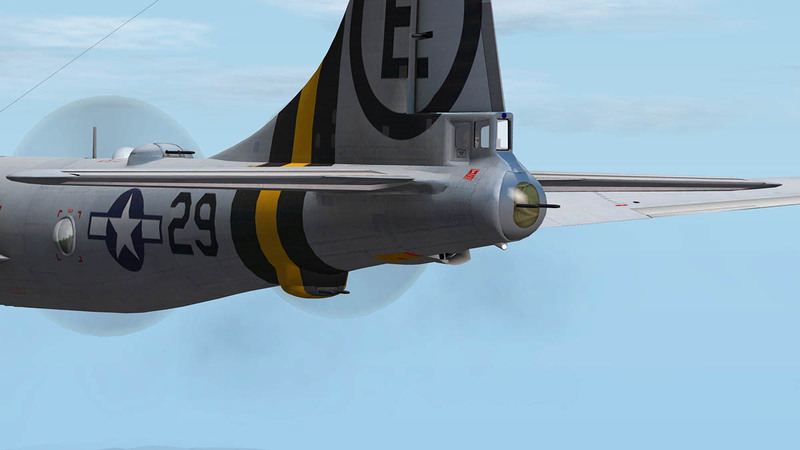 The weight saved by removing the gun system increased the top speed from 357 mph to 364 mph (574 km/h to 586 km/h). 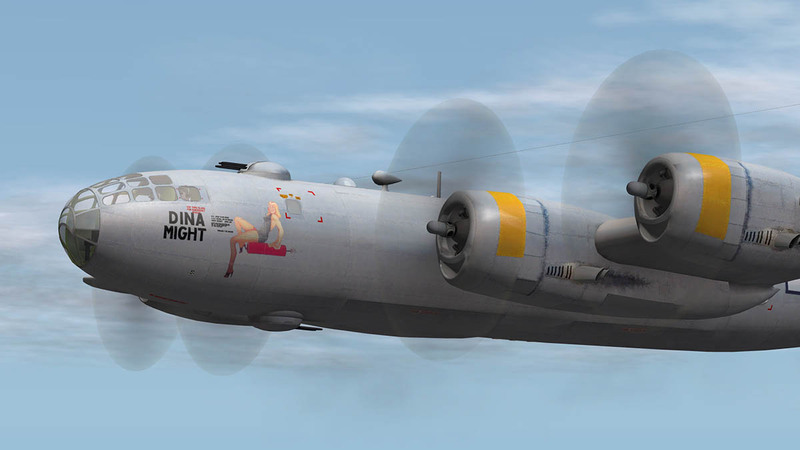 Also incorporated on the "B" version was an improved APQ-7 "Eagle" bombing-through-overcast radar fitted in an airfoil shaped radome under the fuselage. All the "Silverplate"aircraft (Including Enola Gay and Bockscar) are "B" versions. 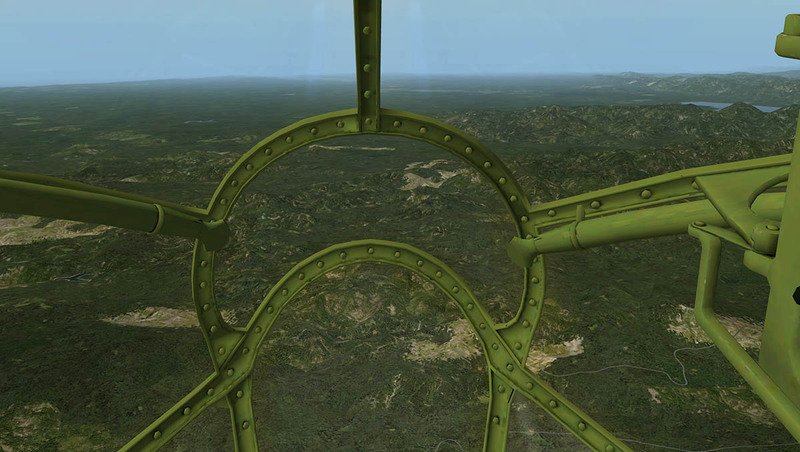 The two versions can also be seen inside the cockpit with the "A" version having a huge turret base hanging from the roof, and in the "B" with it removed. 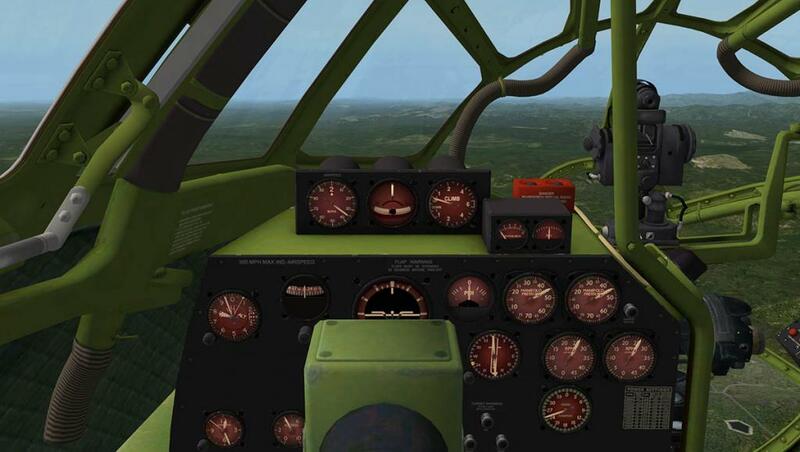 The pilot's position is quite unusual and you need to familiarise yourself with the controls and the certainly the instruments before flying the aircraft, a quick "I want to fly" will find you scrabbling around trying to find things and the aircraft not performing as you wish it to. All the instruments are all noted here but some are not in the usual form. The manual needs a look over to note what you have. 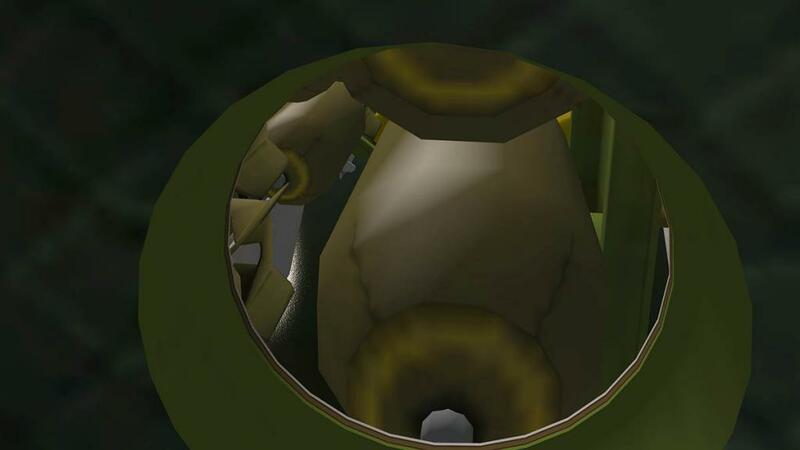 The huge (but beautiful) yoke obscures a few of the instruments and you easily find yourself looking over or around it to see what you want to. Thankfully it does retract downwards and out of the way and line of sight. 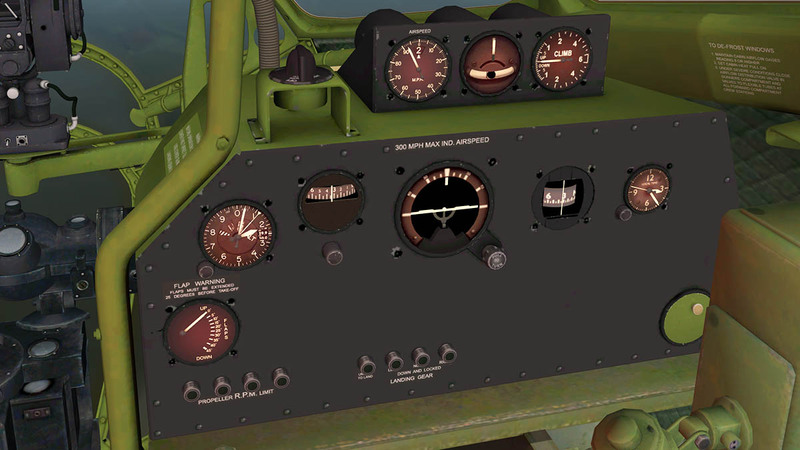 The three main instruments are positioned separately on the top of the panel. 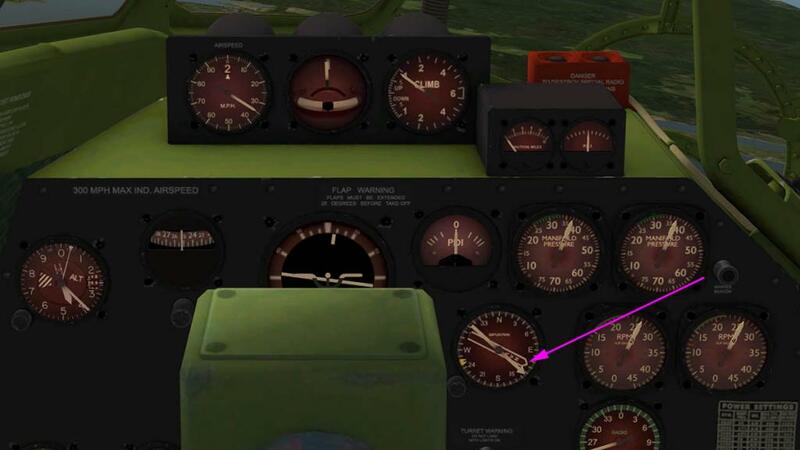 These are your... Airspeed (in miles per hour) - Rate of Turn/Slip Indicator - Vertical Speed Indicator. 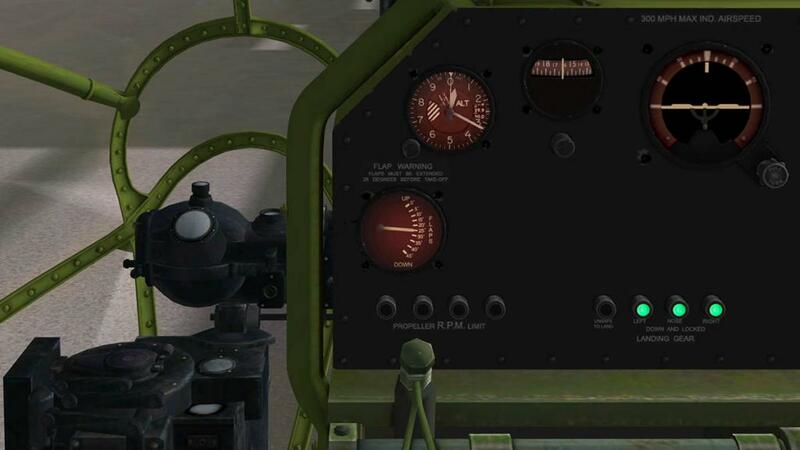 Directly below on the main panel is your Artificial Horizon. Far left on the panel is your Altimeter and compass. 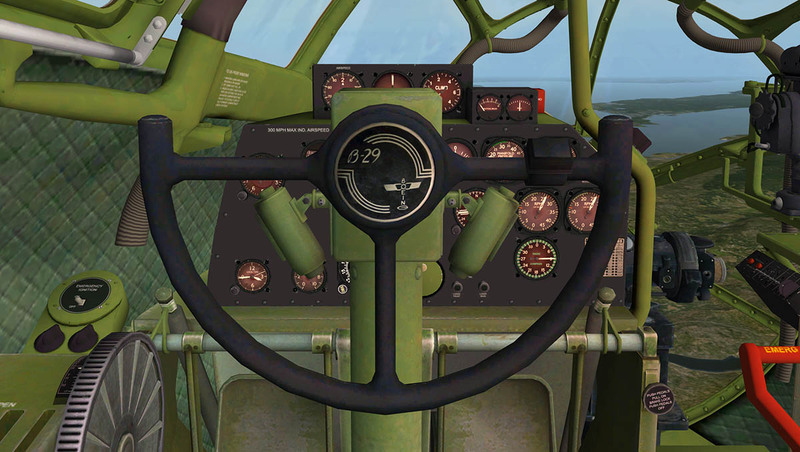 Engine in Manifold Pressure and RPM instruments are on the right of the panel, but are noted in just two dials for each set of engines? 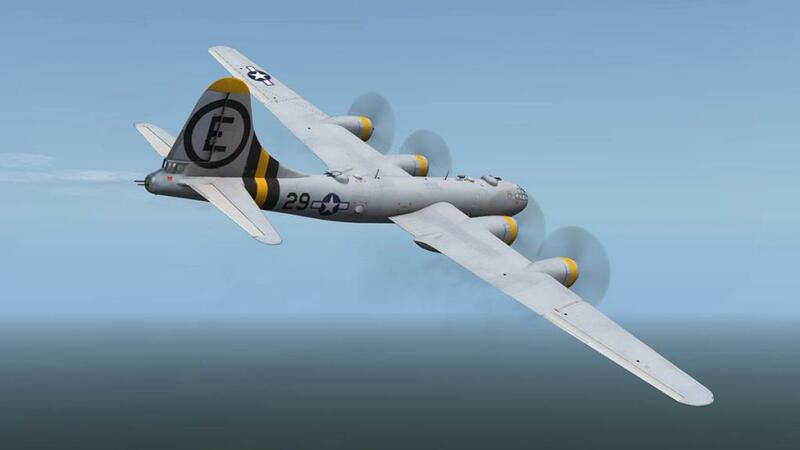 But doesn't the B-29 have four engines and not two? 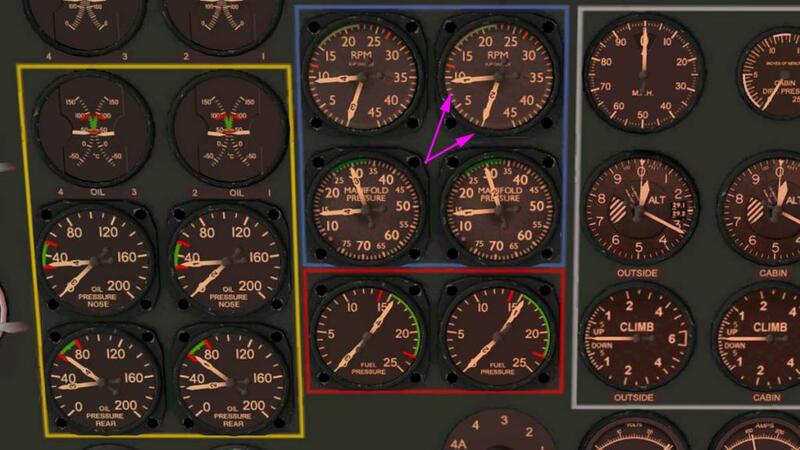 The system used here is that each dial has two needles labeled 1 or 2 (on top) and 3 or 4 (on top), only when an engine is running off the speed of the other engine does the needle of that engine show. 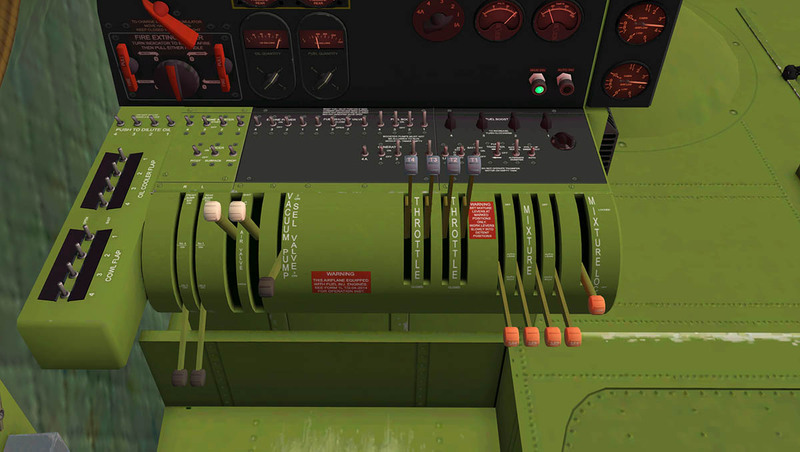 It is very clever in that if one engine on one side of the aircraft is running not to the performance of the other engine then the needles will distinctly show the differences between the two engines, this system is used throughout all the engine displays. The heading instrument is unusual in that the compass is locked. if you turn the heading to the west (W) then the aircraft will fly west, but unlike modern headings it does not turn as the aircraft turns. It feels a bit odd at first but it is great for navigation. 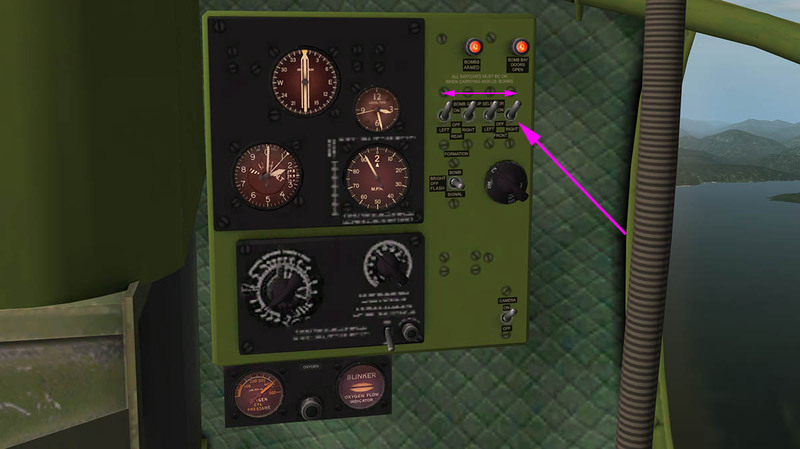 Inset in the heading as well is a Radio Magnetic Indicator (RMI) with a Nav 2 bearing and NDB pointer. These needles will show you the direction of a Nav-Aid on the compass. 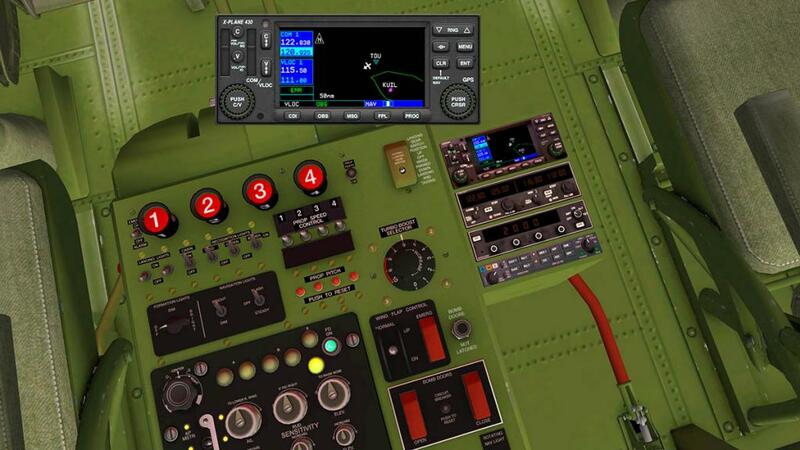 On the pilots right hand side is a console that has the a basic, but very good autopilot. It is overall very simple to operate with a MSTR switch (on/off) - HDG (heading) - ALT Hold (Altitude hold) - NAV (holds a VOR2 course) - APPR (Standard X-Plane APP). 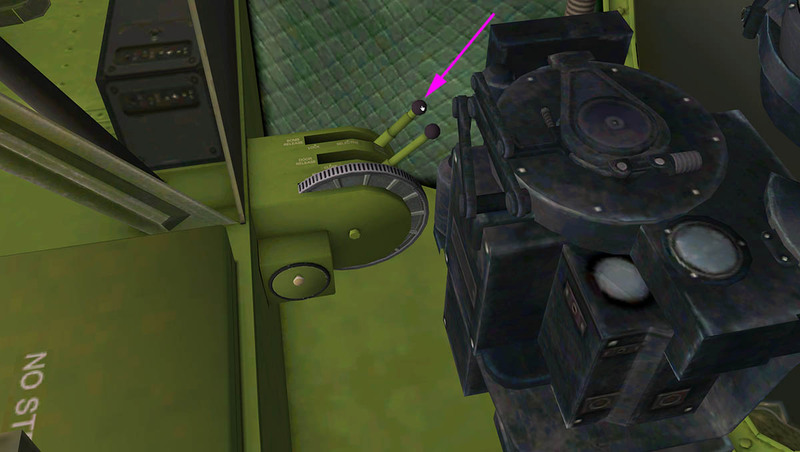 There is a knob top right that adjusts your pitch, or in this case moves the aircraft's rear elevators up or down to climb or descend. There is a metal guard to switch off or reset the AP in one go. 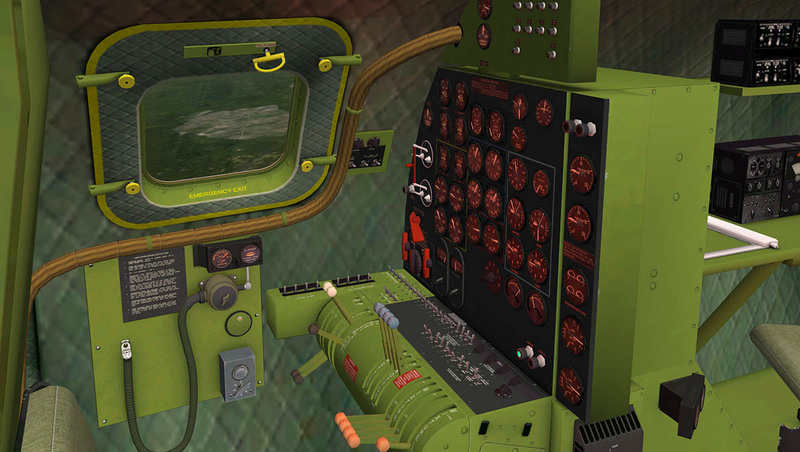 On the very top of the console is a red set of four buttons that are the propeller feather buttons. 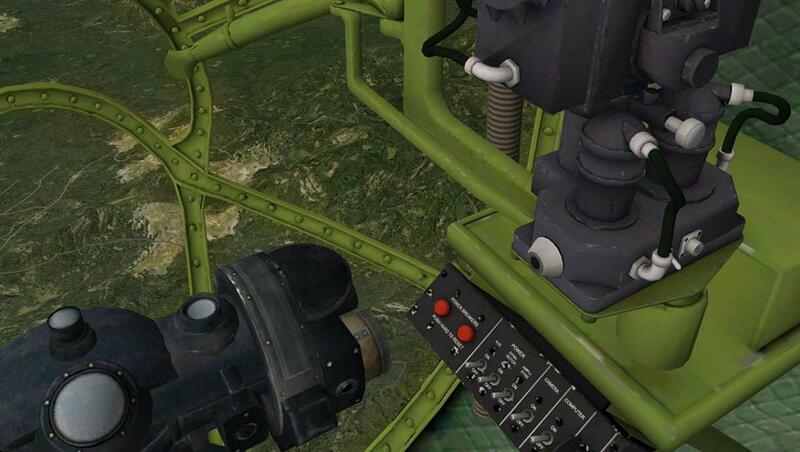 These buttons will allow the require propeller to just windmill and reduce drag or stress on the other engines. 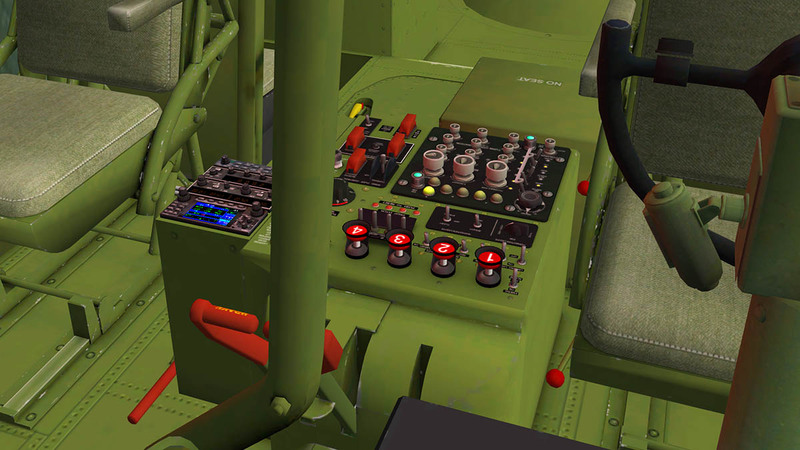 Lighting switches and Turbo Boost (used sparingly) and prop speed switches (high or low and again used sparingly) and under flaps are undercarriage raise and lower, and opening or closing of bomb doors (front and rear). 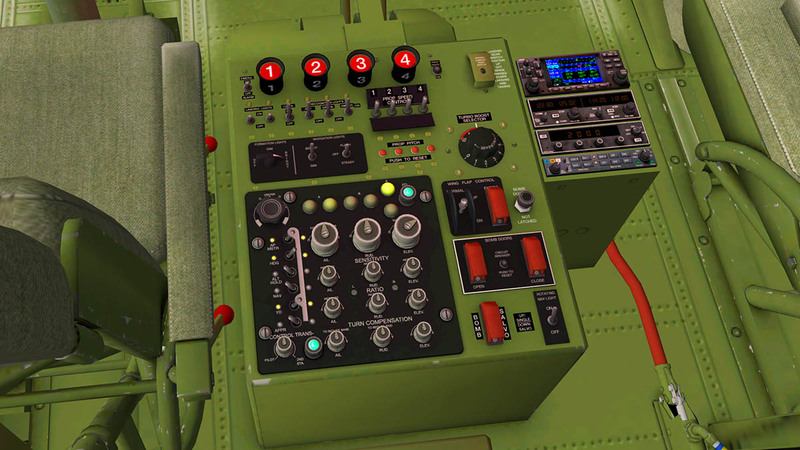 Attached on to the side of the console are a rack of radios, In reality they are standard X-Plane radios in a Garmin GNS 430 GPS with pop-out screen (this is your Comm 1 and Nav 1), a Comm 2 and Nav2 radio, transponder and audio selection panel set. They don't look to out of place in a WW2 era aircraft, but there are handy in any case. 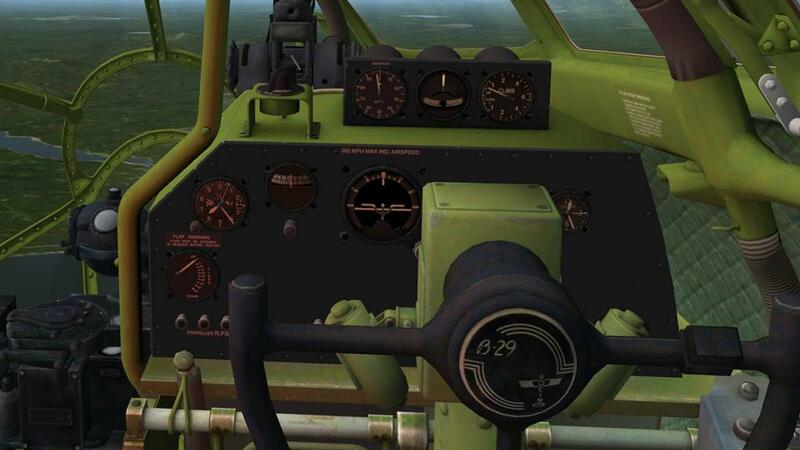 The co-pilot station has only the main flying instruments, and the aircraft's flap setting in degrees. The B-29 has a very large continuous flap adjustment to 45º and a minimum of 25º is required for takeoff. RPM limits (high) are noted here as well. 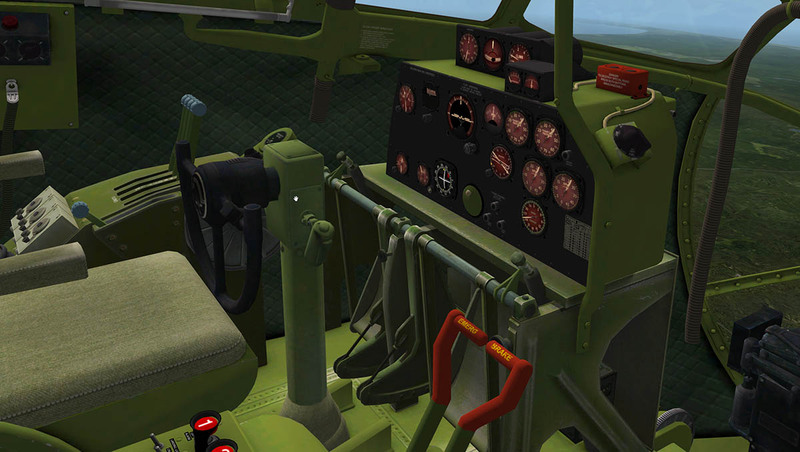 Panel lighting adjustment is via huge knobs on the side and top of the panels. 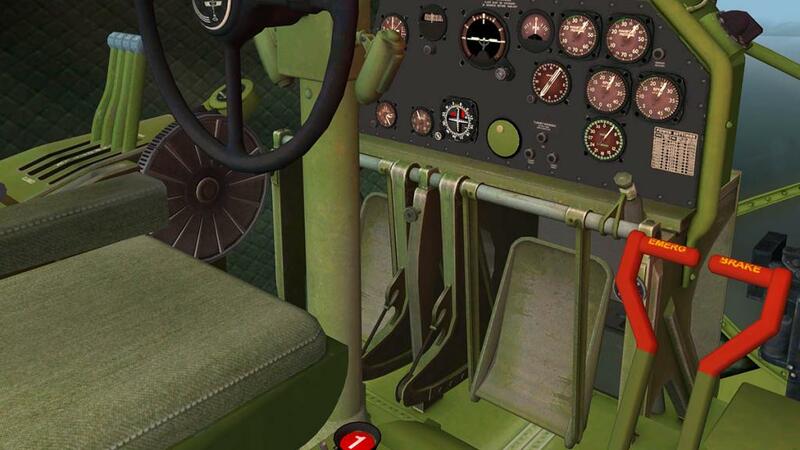 Huge bucket rudder pedals dominate the floor and they with the engine (four) throttle levers and large trim wheels duplicated at both flying stations. The big Red handles are just the humble parking brake! The Flight Engineer's station is very comprehensive that covers, Main Hydraulic Reservoir Quantity - Main Hydraulic System Pressure Indicator - Carburettor Air Temperature Indicators - Wing Leading Edge De-Icing System Pressure - Cabin Air Temperature Indicators - Engine Fuel Flow Indicators - Emergency Hydraulic System Pressure Indicator - Cylinder Head Temperature Indicators. In a yellow boxed area are the, Engine Oil Temperature Indicators - Engine Oil Pressure Indicators (forward, nose and rear tanks). In the center in blue are the Manifold Pressure and RPM instruments. 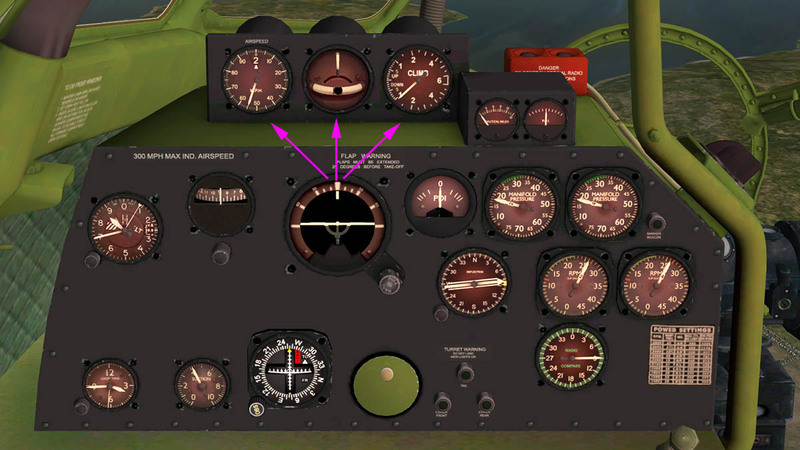 Red area below is the Fuel Pressure Indicators. 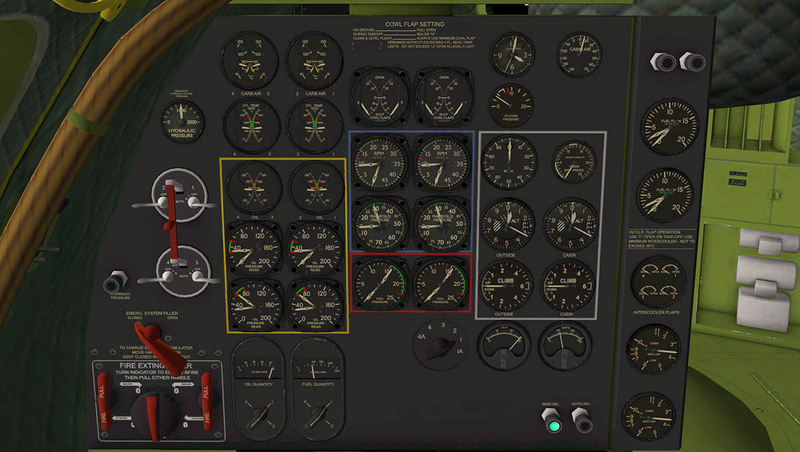 In the Grey area are the flight instruments (mostly a duplicate of the pilots instruments) but with a Cabin Differential Pressure Indicator. The B-29 also has a built in APU (Putt Putt) that is started on the lower panel. 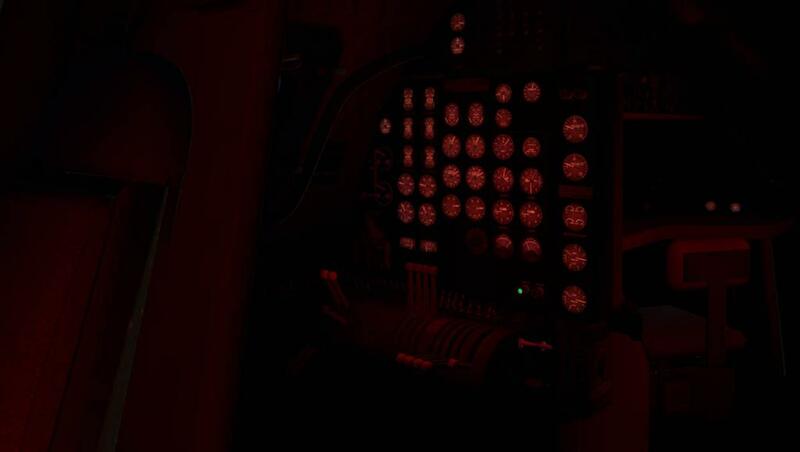 There are also two (rotary) lighting knobs for the lower and upper panels. 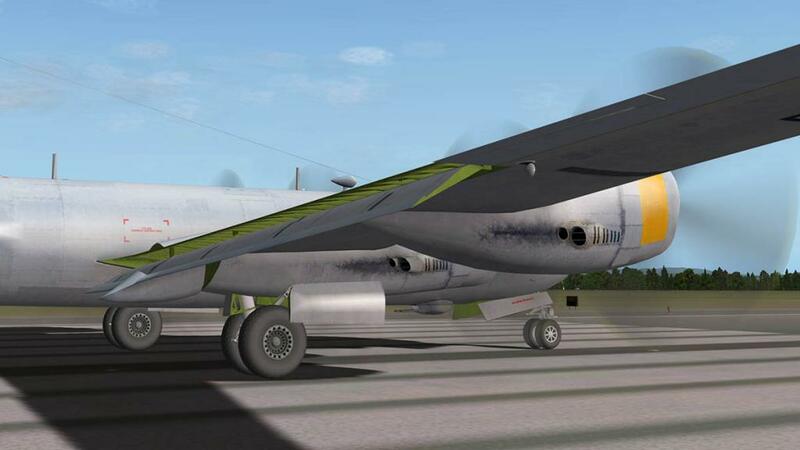 This aircraft shows how complex aircraft became when the pressurization systems became a requirement, but also how they started to automate many of the standard functions to cater for that complexity. The engineers station, besides the scanning of the aircraft's systems was also in control of the aircraft's main controls as well, the only thing missing here is the yoke. 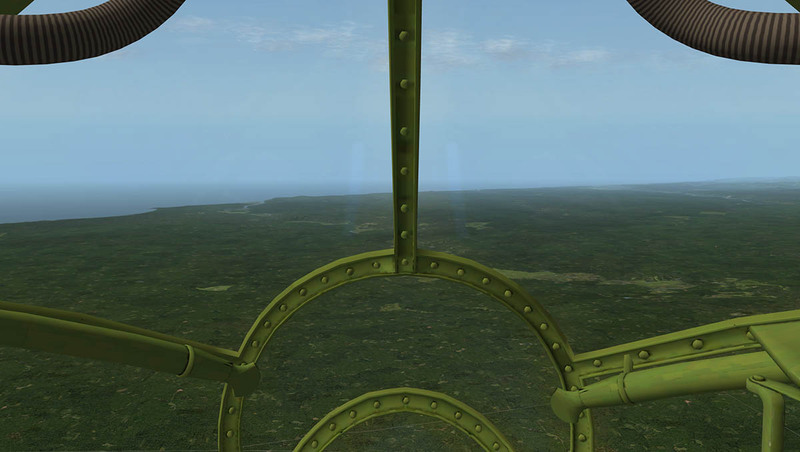 The view out of the side (small) window is excellent with those huge propellers running hard in the slipstream. 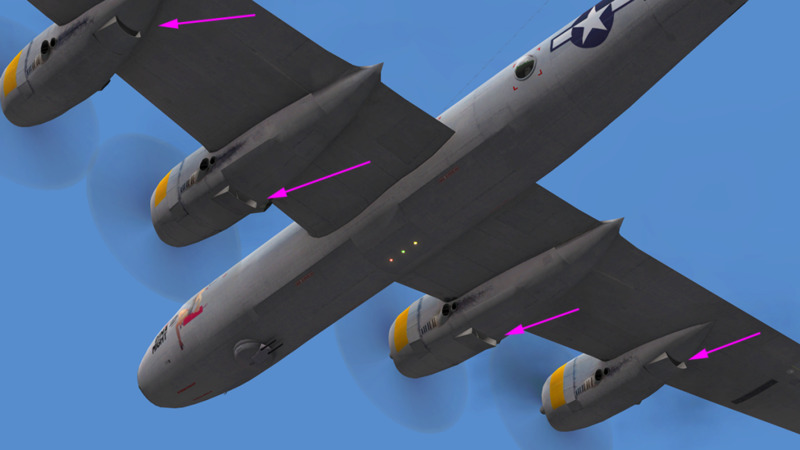 Cooling is helped by using the cowl and oil cooler flaps on the engines. These are activated by the switches on the FE's left side. 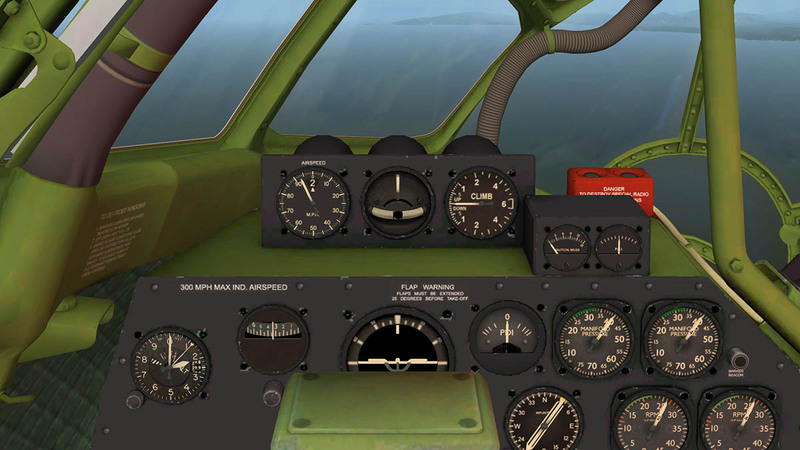 You will need to keep an eye on all the engines temperatures and keep them well into the green zones with these aids, but can't be used high in the cruise zone. 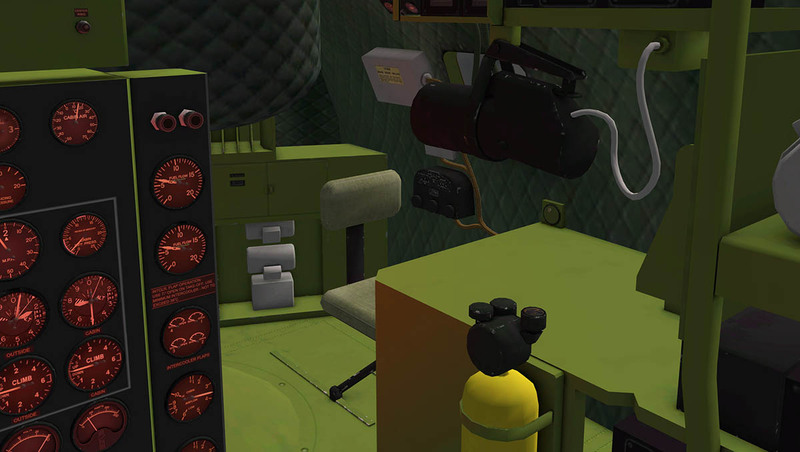 The forward Bombardier's station is very well designed and well done. There is a moving gun sight that can be moved into the central position for aiming the automated turrets. 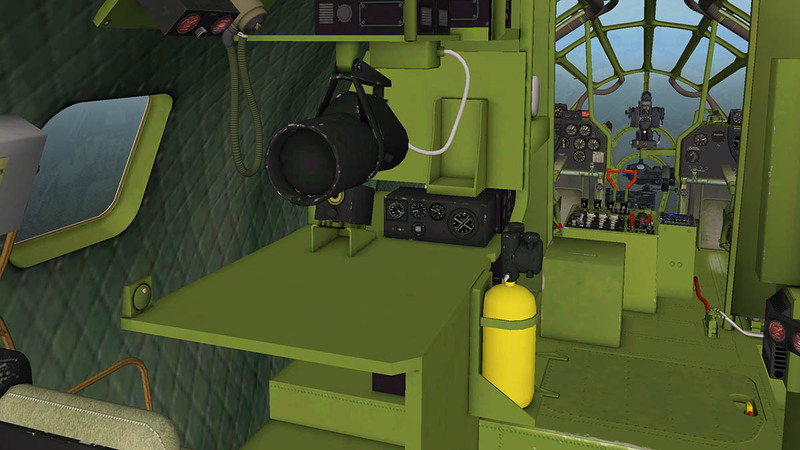 If not in use it is positioned on the right and the lower bomb aiming-sighting device is then used. 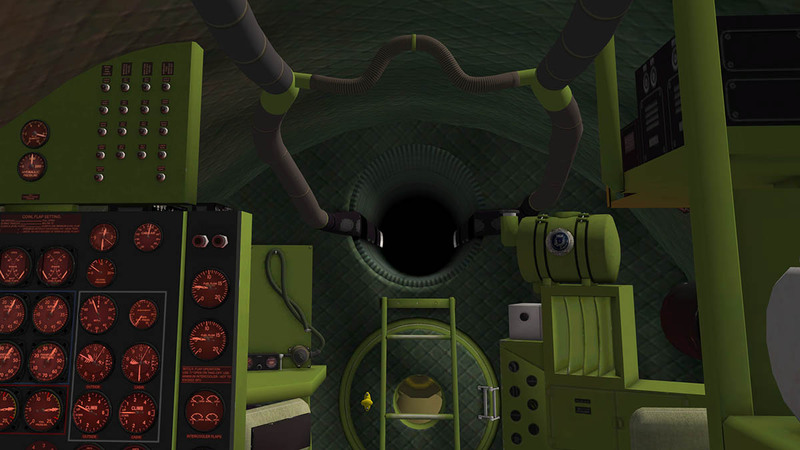 The bombs can be seen through the porthole window in the rear cockpit pressure door. 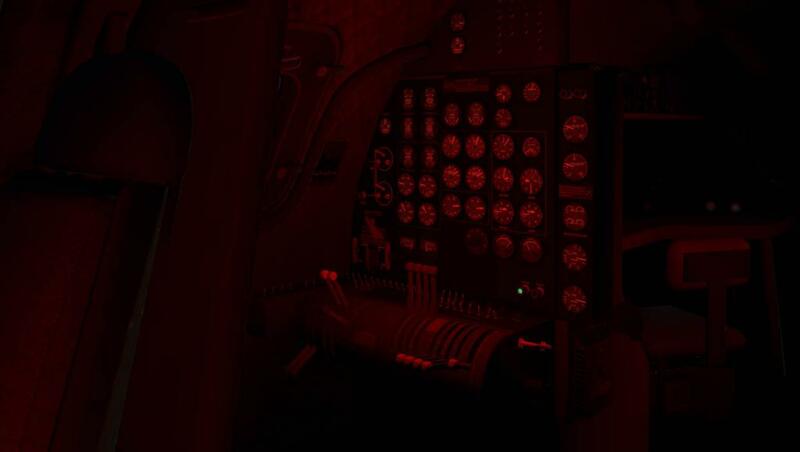 The control panel is on the left wall and the four switches will arm the bombs. 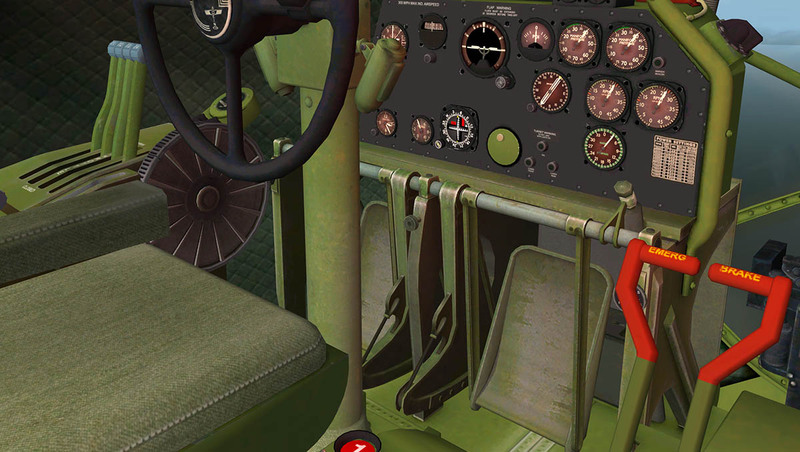 The bomb doors can be opened by switches (covered red) on the console by the pilot or by a lever on the floor by the bombardier. 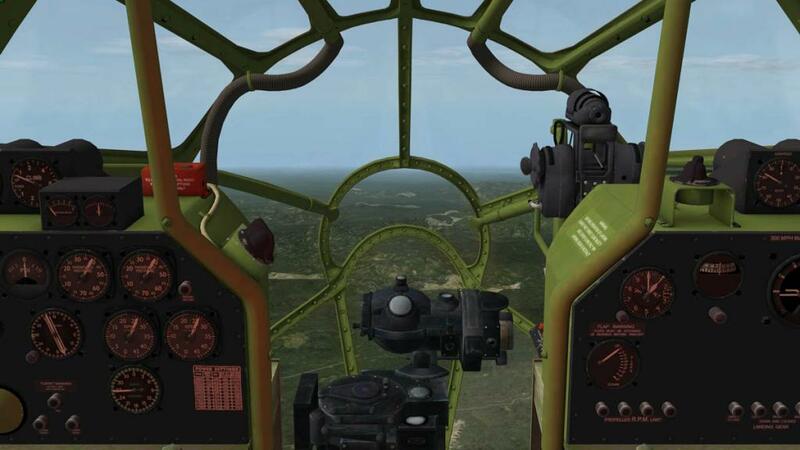 you have two firing options in when the left lever is in the mid-way position it will drop each bomb separately, or full forward you get a salvo drop of all the armed weapons. 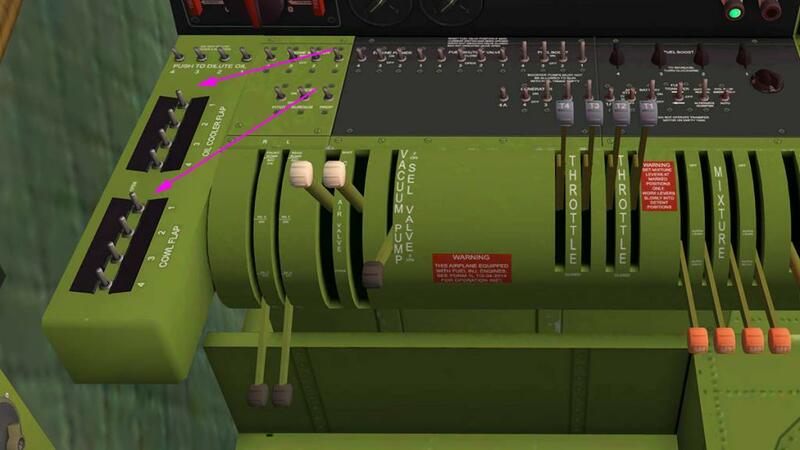 You can reset the armaments by the standard X-Plane Aircraft/Weight and fuel/Ordnance menu. 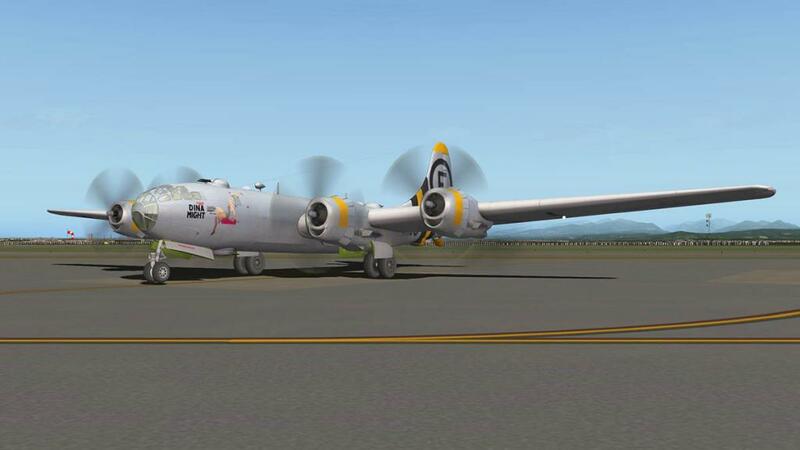 There is a great bombing guide reference in the manual to help you aim (or destroy) your targets... you get the standard X-Plane explosions and smoke. Sorry no nuclear weapons here, just standard bombs. 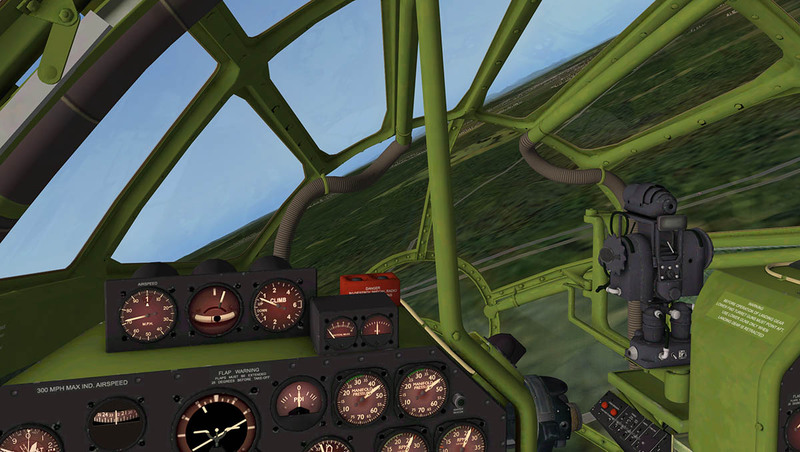 Aircraft like these fall into two categories in one, average and easy to fly and a bit of fun. Or two are really deeper than they seem to be on the surface. The B-29 Superfortress falls easily into the second category. This is an aircraft that gives you back more the more you invest in it, it has to approached in a more serious way than just as a bit of retro fun. 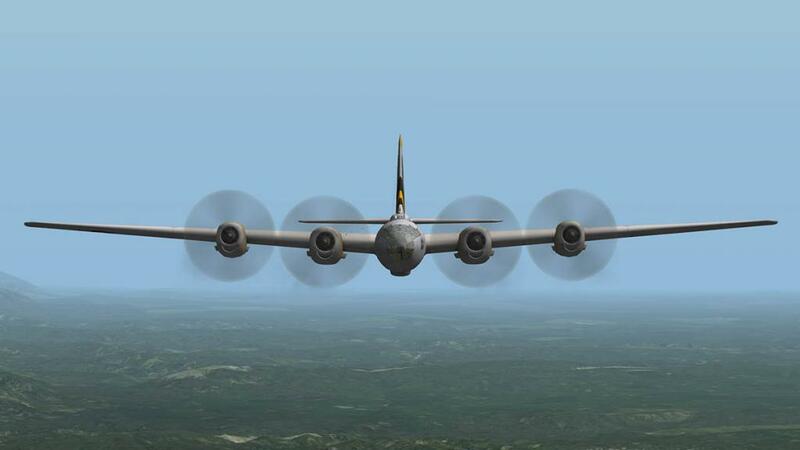 Point is this is a heavy bomber, and heavy bombers are ponderous and slow. But the skill here is to fly them with skill and intelligence. 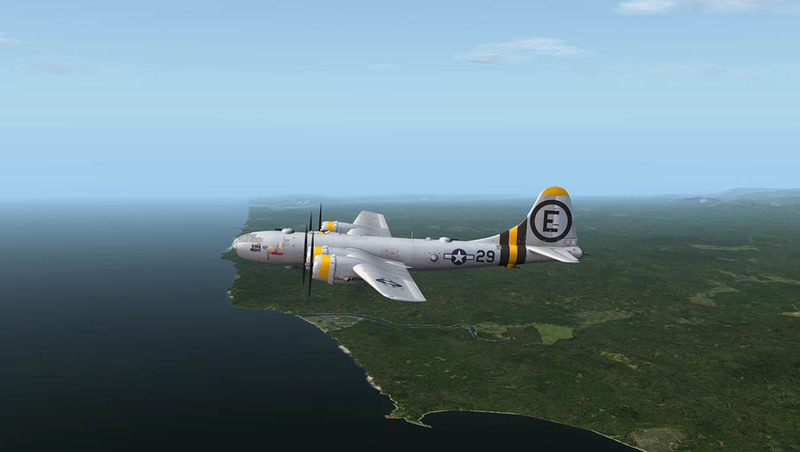 Do that and the B-29 rewards you with a great experience. 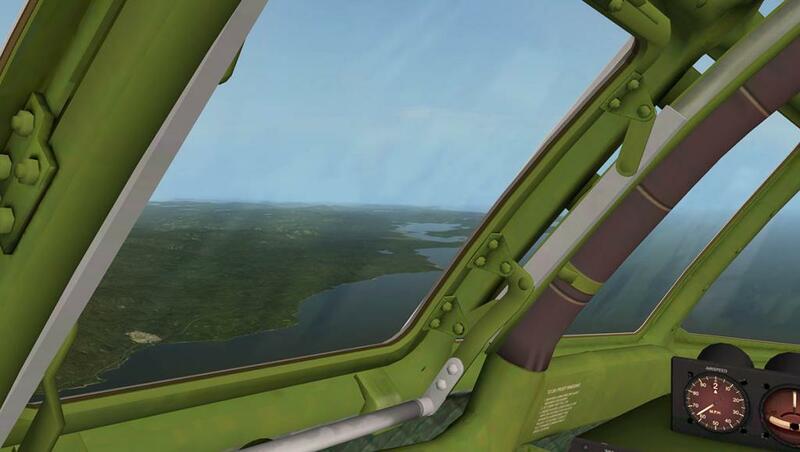 It is the unusual pilot's seating position that makes the aircraft interesting, the views as you control the aircraft are simply excellent, but it is the feel you get back as well as move this heavily laden aircraft to its destination and back. 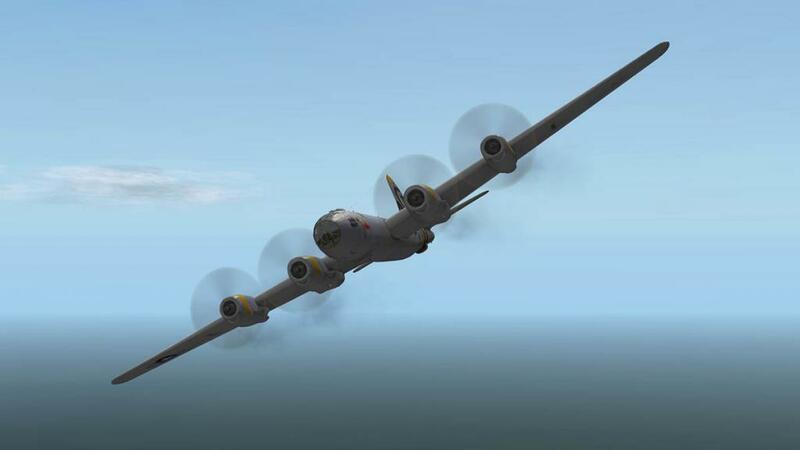 You need that 25º flap to get you into the air and the aircraft does so and quite quickly, you still need that lift, but also flaps give you lots of drag as well so you are now having to find the best compromise between speed and lift. The aircraft is not a fast climber, 900ft per minute is the maximum anyway (loaded) so 700fpm is a nice start, once clean and more speed above the 200mph range then 500fpm is the best compromise to your final height if you are going above 25,000ft. Climbing slowly to a high altitude will take forever, and it feels like it, but there is a satisfaction in getting the right performance out of the aircraft and keeping the engines within those cooling parameter safety zones. 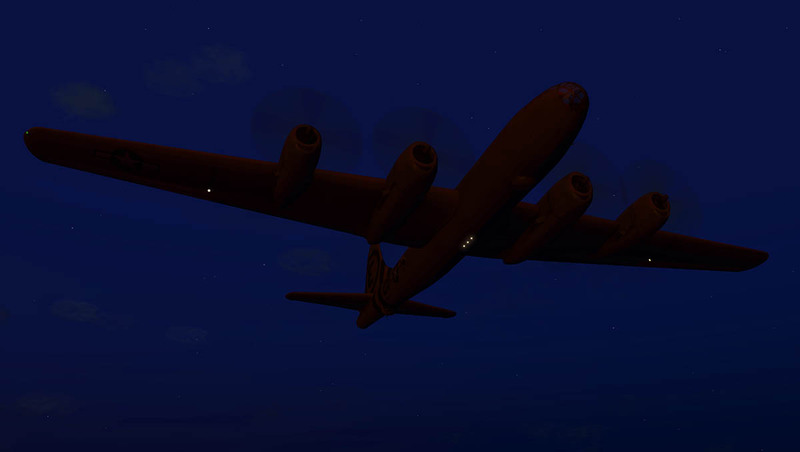 The sounds are excellent as you gradually drag yourself higher and the propellers are biting the thinner air with their lives, the constant drumming gets you into a rhythm that feels safe and powerful. As you leave the coast (Still climbing...) you start to feel what those brave souls must have felt as they left the secure world behind and headed into the dangerous world they were going to. It is fast for an aircraft of this era at nearly 200knts in a low altitude cruise (FL250) and nearly 300knts in a high altitude maximum cruise (FL300), the aircraft will power away and cover the distance at a fast pace, But it soon becomes very lonely, with just you and the aircraft flying up there in empty space. 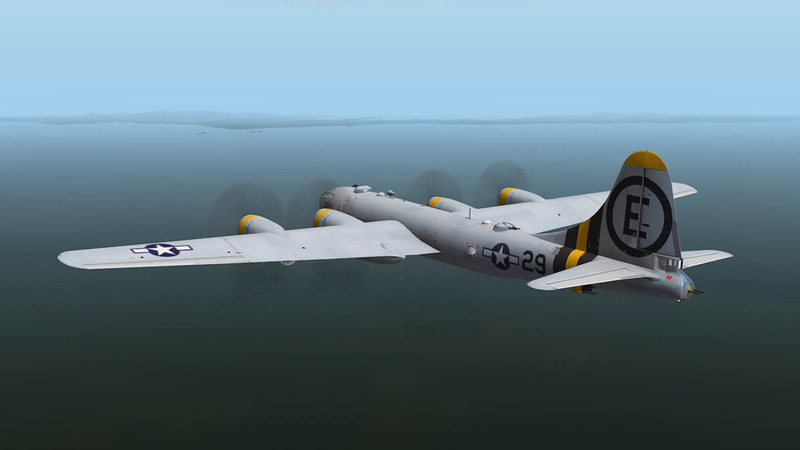 Thankfully the B-29 feels safe and magnificent around you. This is a wartime aircraft so the the lighting is very discrete. instruments can adjusted as noted, but you cannot adjust the red cabin lighting, it is on or off only... but looks good. Outside there are formation lights and three colour recognition lights which can be set at flash or steady. Arriving back home and the aircraft is lighter, but still no machine to toss around the sky. 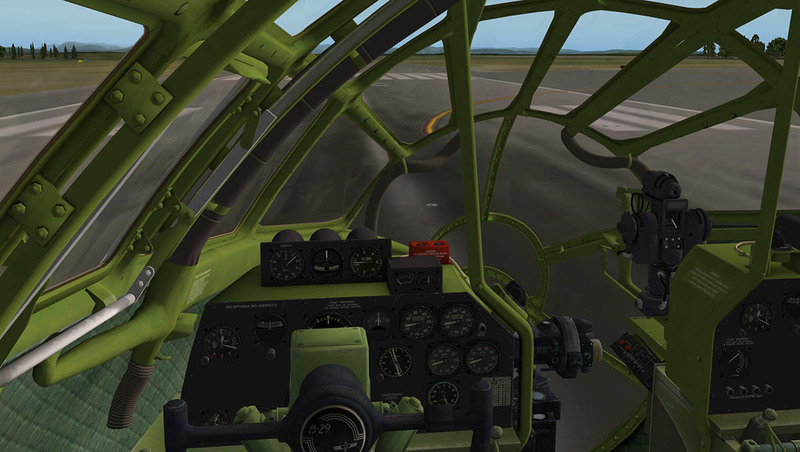 The thrill is getting the B-29 right for landing. Like going up the descent takes time, so you have to plan and start coming down early. 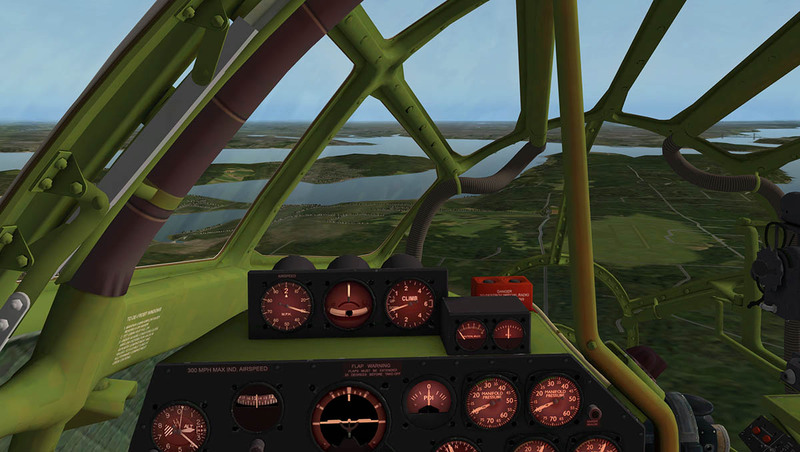 the aircraft is quite nice in your hands and you can easily enjoy the view as you do sweeping turns as you get lower and into single digits in altitude. 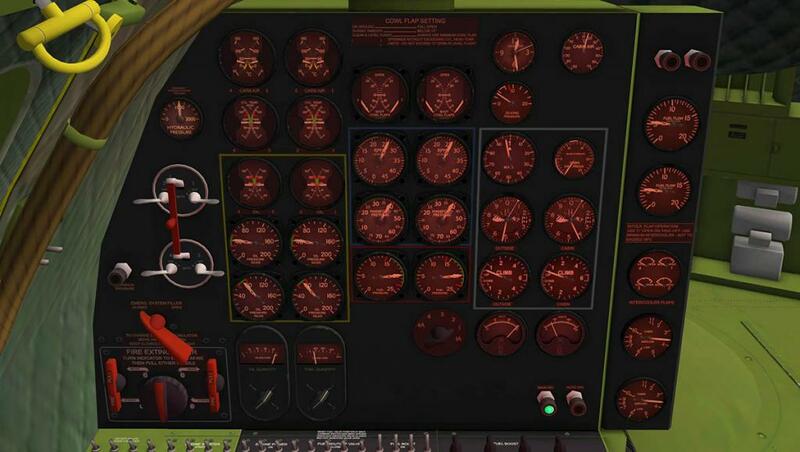 I am doing no artificial aids here like with the X-Plane APP (Approach) or using the GPS on a flightplan. 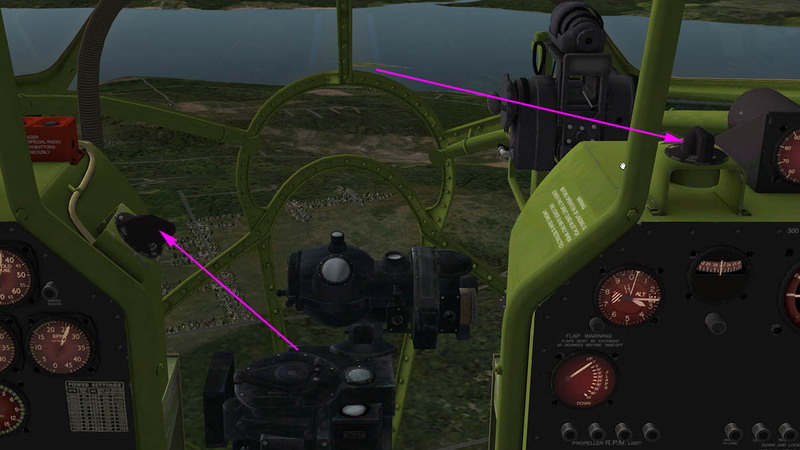 It is just me and me flying the machine with the NDB pointer to guide me in. A long approach is best to get the aircraft pitch down slightly and slowing up the speed, 150mph to 120mph is nice under full 45º flap, but the final approach speed was around 100mph. 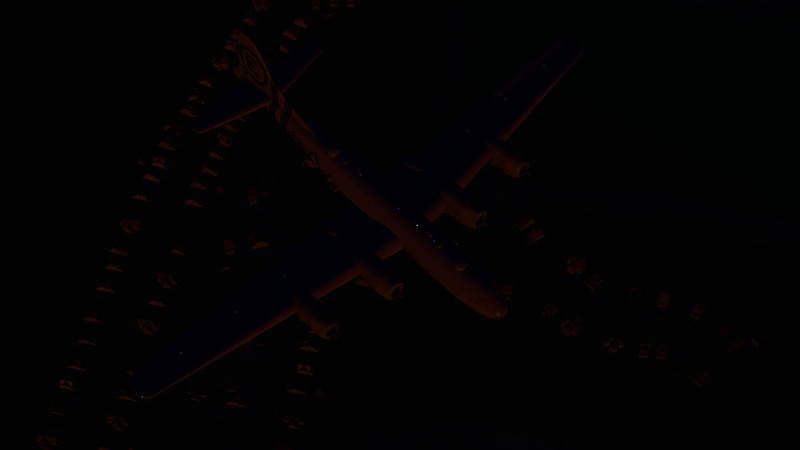 Frame-rates overall were excellent and always very high (30's and 40's) until I arrived at the final approach to McChord AFB, something was absorbed and it dropped to a unhandling 5 frames, and then as quickly as it came it went back to normal? I tried the approach 4 times with the same effect... no idea what causes it as it does it absolutely nowhere else even with a high default autogen setting? 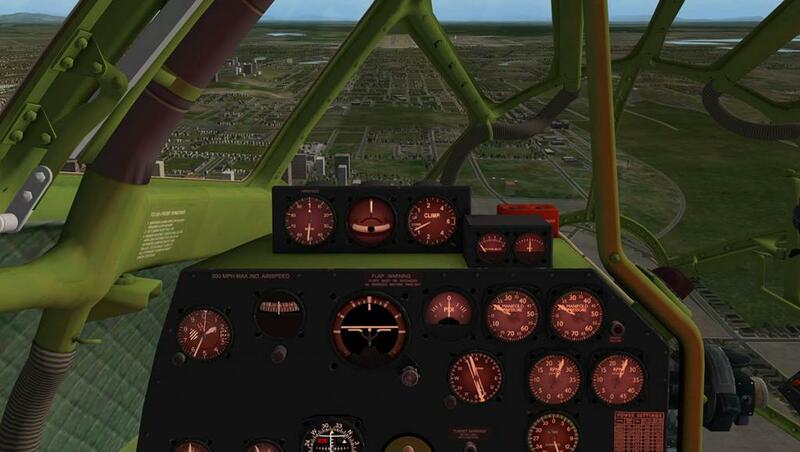 You feel the difference between the heavy and light loads, but the handling is very good at slow speeds, the aircraft will hang there if you let it and the correct slight downward pitch is important, otherwise an approach is very nice and and controllable. 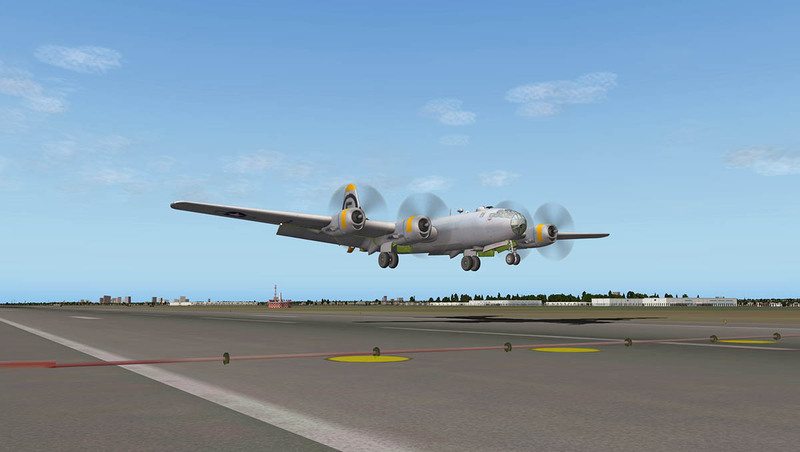 In the flare it is same story and the aircraft will balloon if you let it float, keep the B-29 in control and the landing will come nicely, but don't bounce it on those huge rear tyres. Once down you easily run off the speed and take the taxiway. The engines throb away nicely on the taxiway at minimum throttle and you can again enjoy the great view through the windows. Powering down and shutting off all the fuel valves and the aircraft is silent. 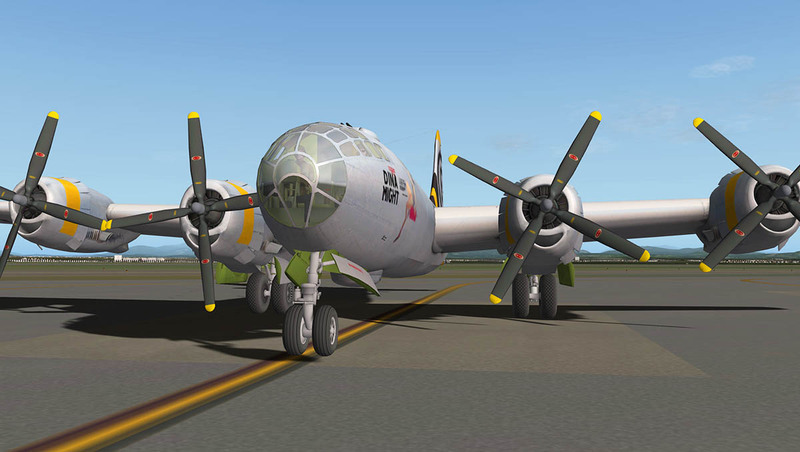 The nosewheel has a tendancy to stay off the ground when empty, so you have to adjust the CoG (center of gravity) a little to the front to make it make contact again. Entrance and exit into the B-29 is by a hatch above and through the front undercarriage compartment, and it opens with a great view downwards... shame there is no ladder. 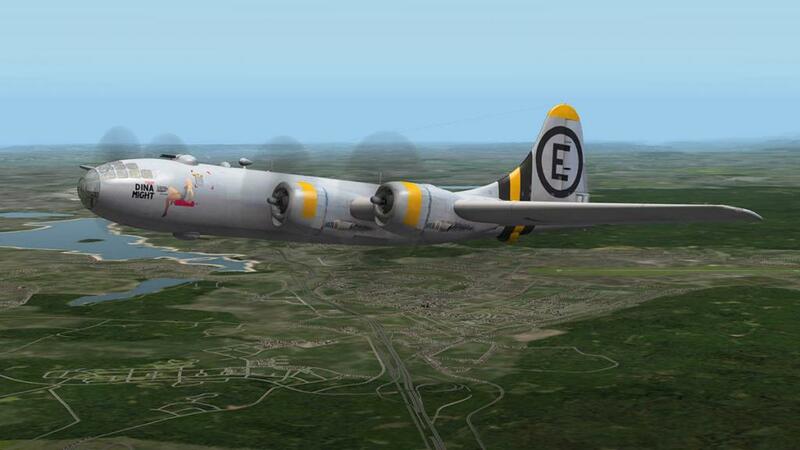 But the B-29 is a majestic aircraft, an iconic machine as well. 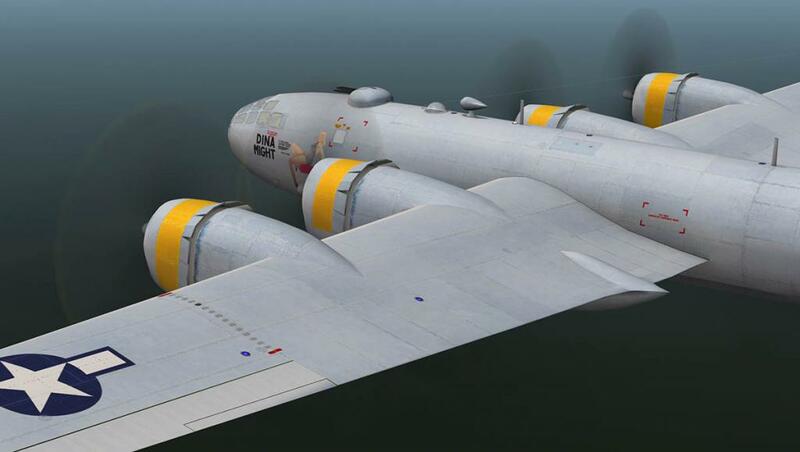 On the surface the B-29 Superfortress looks quite bland, the average textures in areas on the outside and inside and not a lot of surface detail on the outside skin can give this impression. However in most cases you don't notice that, and the tradeoff there is the excellent frame-rate. 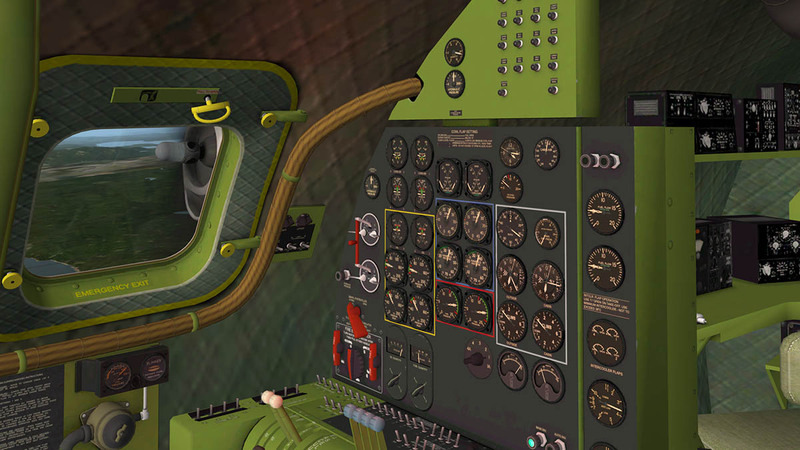 But inside the detailing of this complicated design is excellent, and you really enjoy being at the controls of such an iconic aircraft. 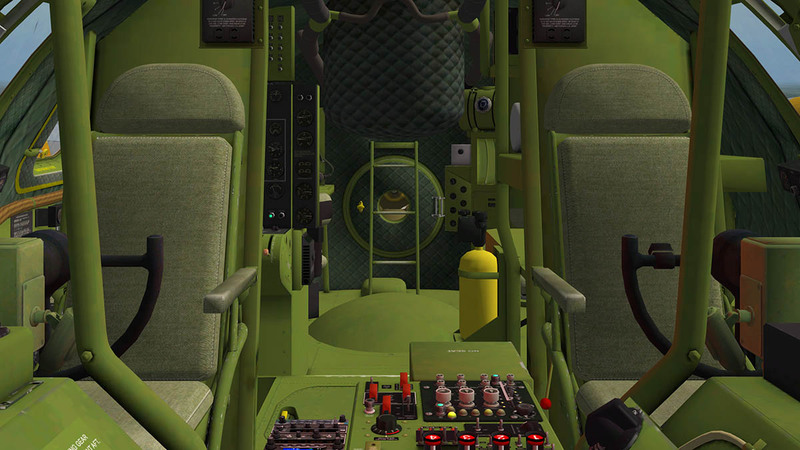 In features it is a little sparse, with just opening bomb doors and weapons, and no access to the central or rear areas. No entry ladder or static items, no X-1 of Chuck Yeager fame or a Little Boy or Fat Man Atomic Weapons and a lot of dials, switches and firing buttons that are just for show and don't work. 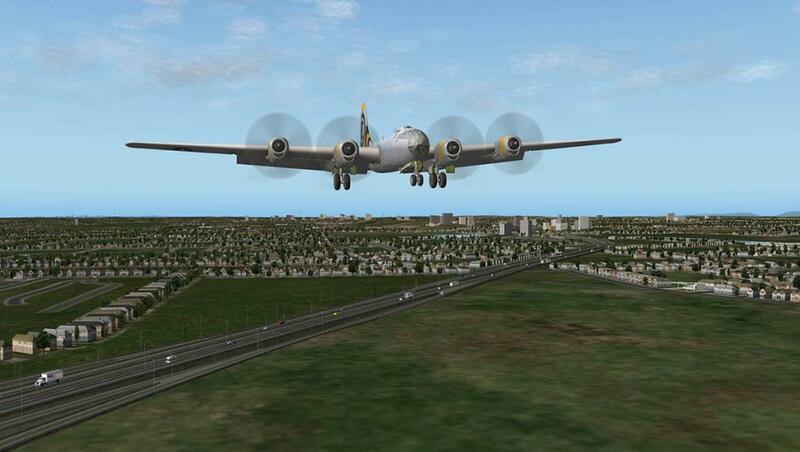 It is in the way you approach and fly the Superfortress is the way you get your rewards from it. I didn't have the time here to do a full mission, but I did do a lot of flights. And the B-29 is a very subversive simulation and even the more so when you design and plan and use the aircraft in your missions. 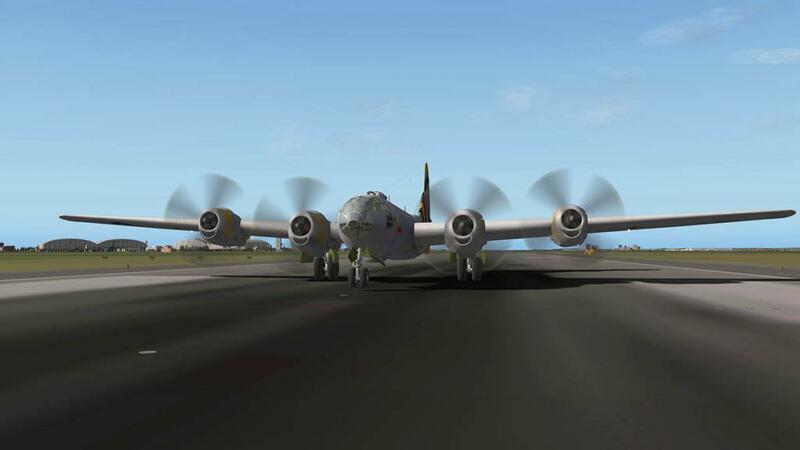 It is slow and ponderous, but that is the huge attraction here, you settle in for a time and really fly the aircraft, watch its delicate systems and manage them over the important takeoff points and delicate landings and those long climbs and descents, and it is really great being in the moment and in there with those huge radials booming away and driving you and your crew to your destination and back. 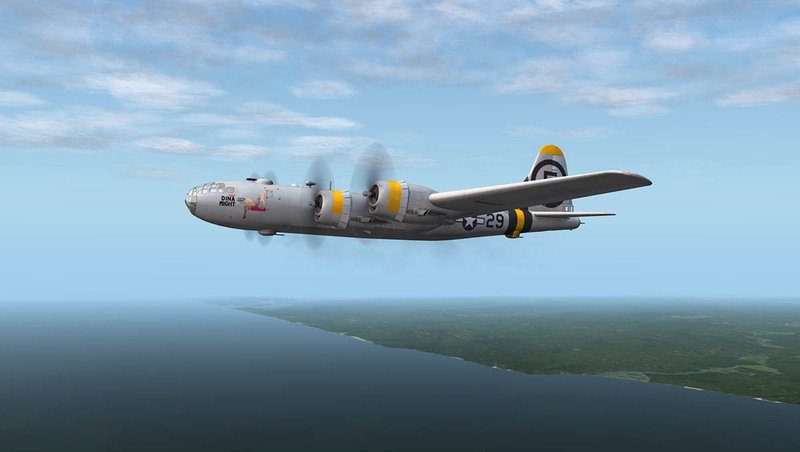 I expected the B-29 to be an average ride to be honest, but came away loving it because it requires a lot of attention and detail to fly it well and pull off that perfect mission, Finally you can fly an aircraft that did change the world in a significant way. The Boeing B-29 Superfortress by Virtavia and Dawson Designs is Yes!... 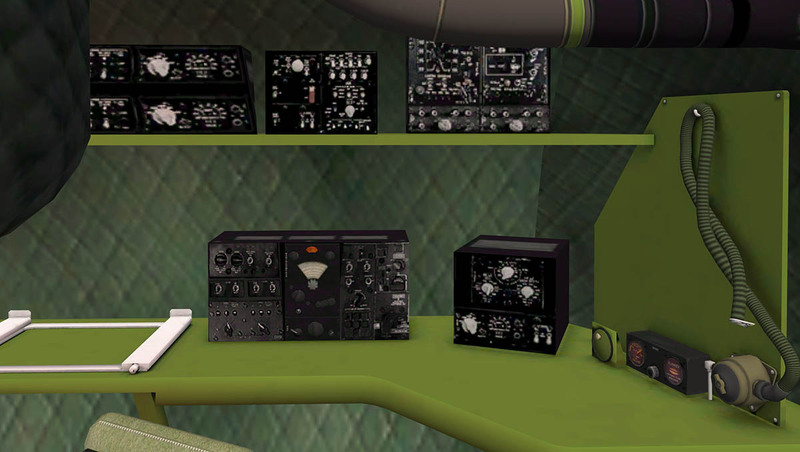 Now Available from the X-Plane.Org Store. 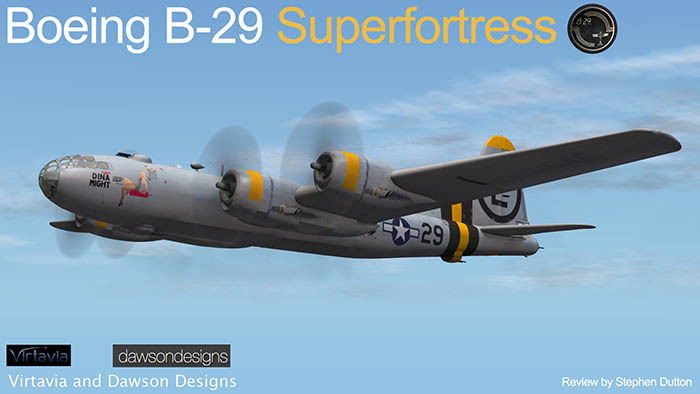 Price is currently US$ 34.95 : Get the - B-29A Superfortress - Here. 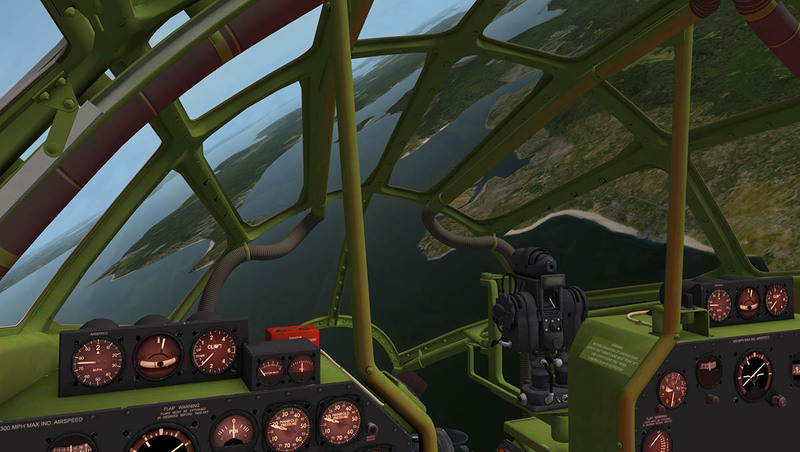 Documents and Install, Download is 209.10mb, that is unzipped into your Warbirds Folder of 309.40mb. 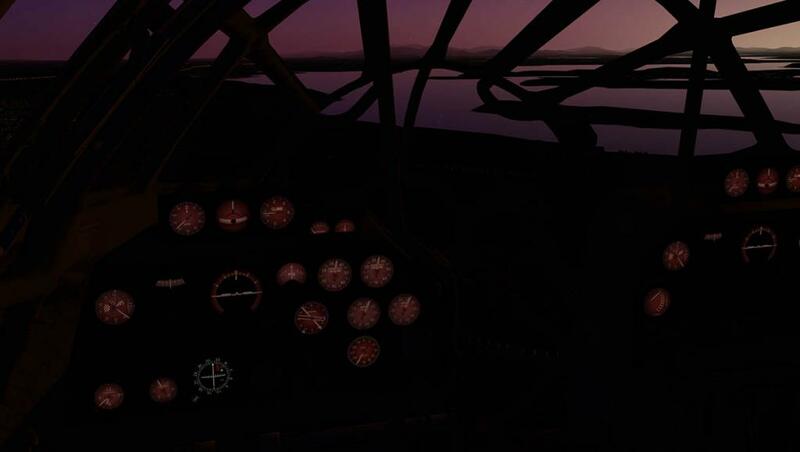 The aircraft will only fly in X-Plane version 10.30. It will be available very soon!